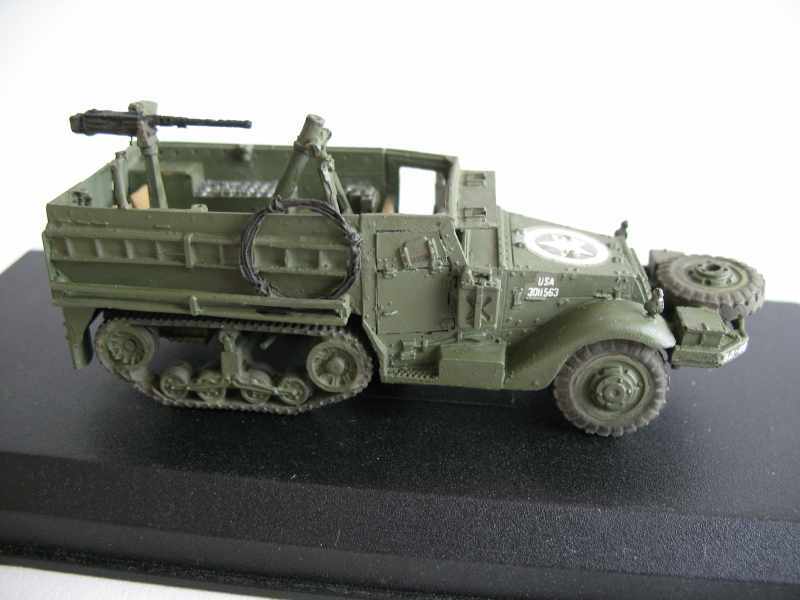 Years ago I have made masters in 1/76 scale for the resin manufacturer Milicast in Scotland. 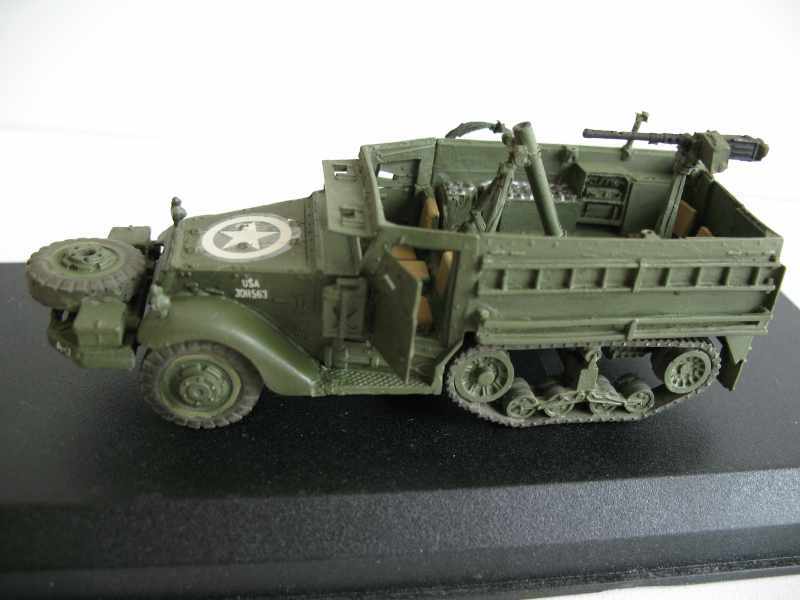 In that time and for the 1/76 scale, the masters were high detailled and from a high quality. 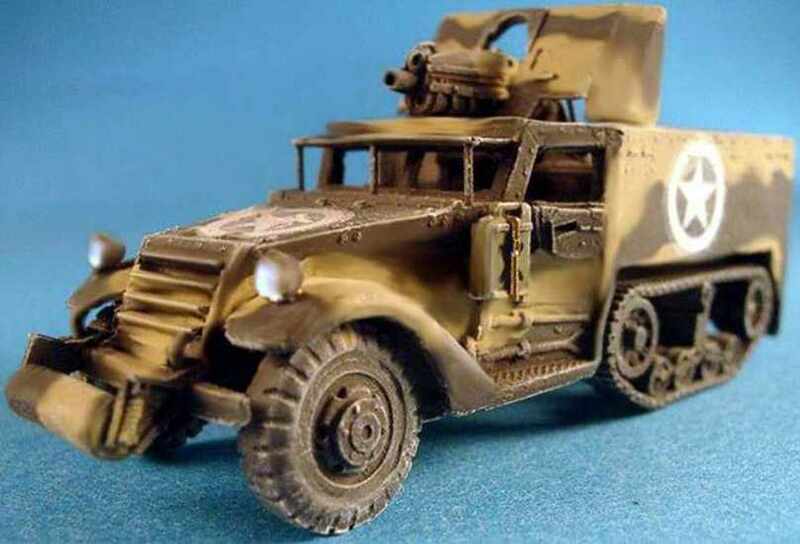 After years the masters are maybe a little bit outdated, but in this scale very acceptable. 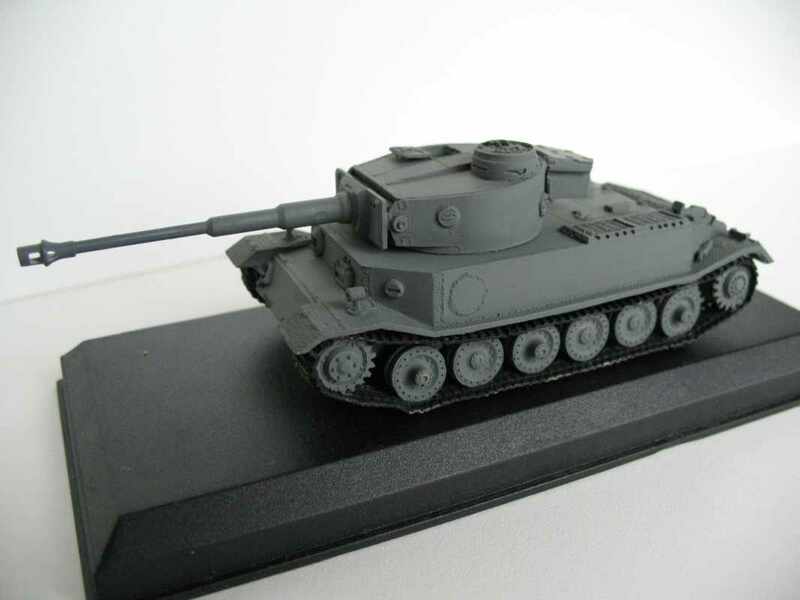 So as in all resin companies the quality of the kits are dependent on the grade of the master and the casting. 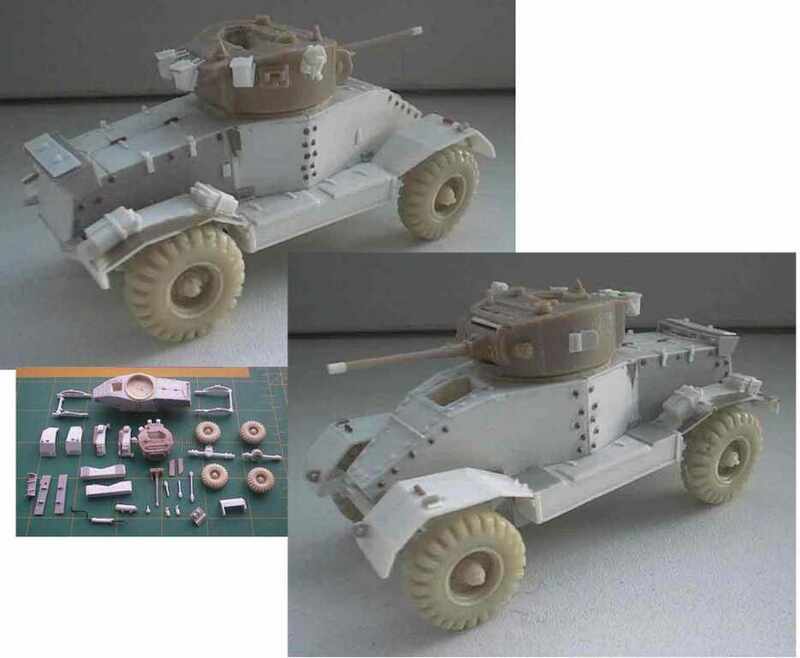 The quality of the resin and castingmethod are anno 2007 much better then five years ago. 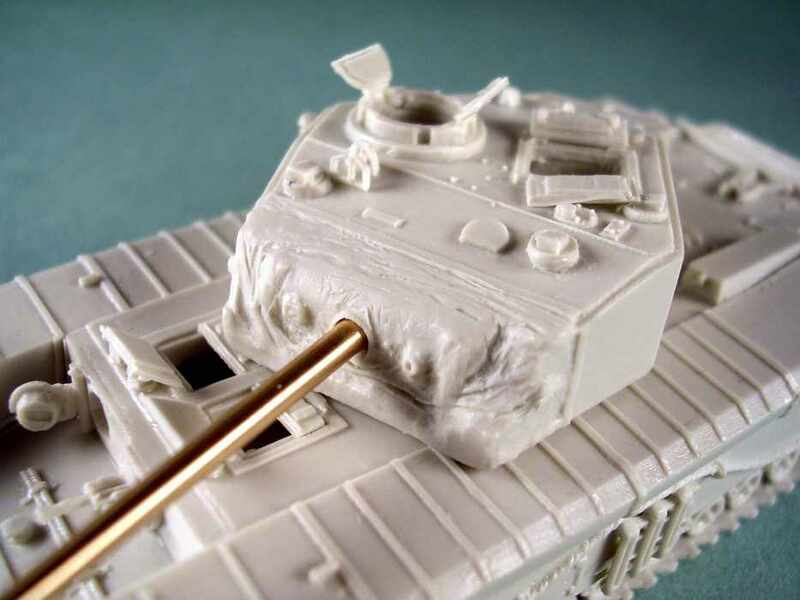 It's sometimes needed to rework and/or update the master after a while. 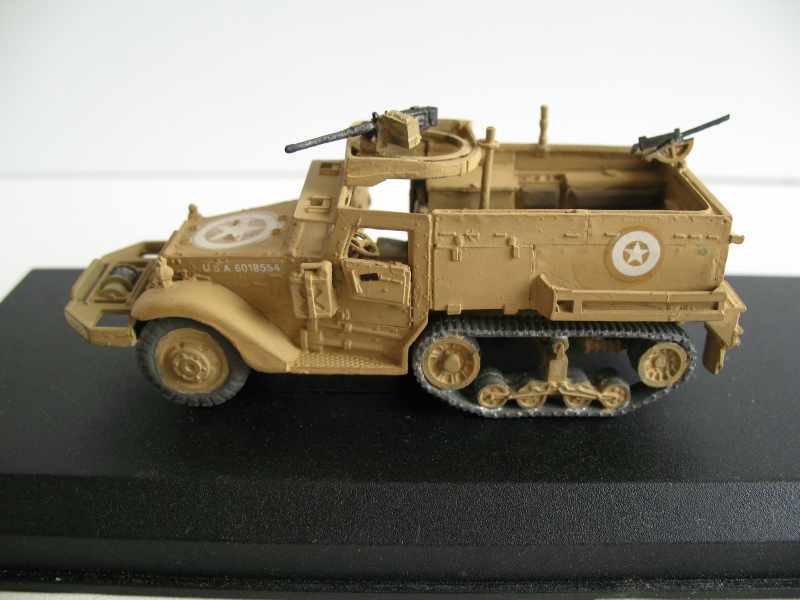 Not all copies of the masters I have made are in my collection, but I have showed what is possible for me. 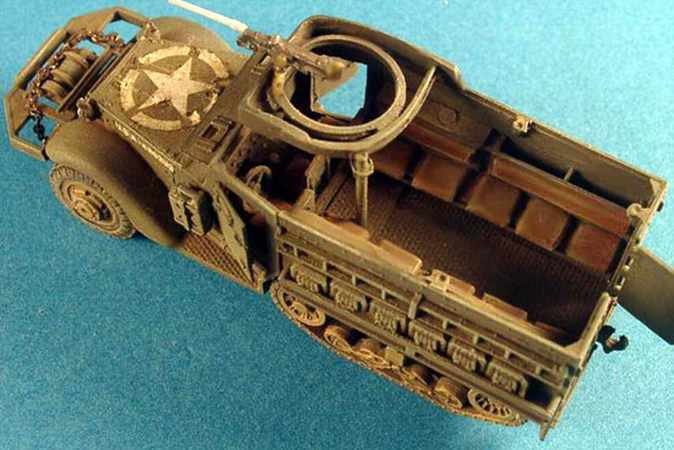 The original A.E.C. 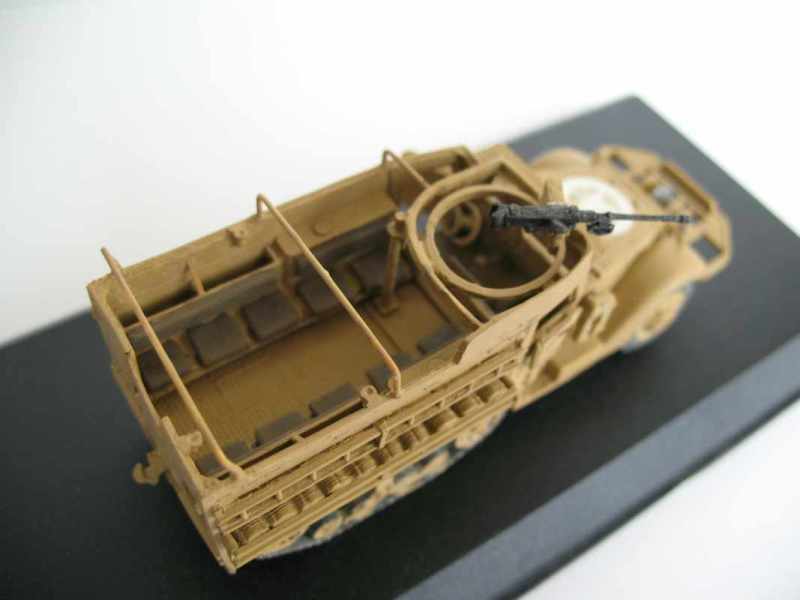 Armoured Car Mark I was conceived by Associated Equipment Company Limited in 1941 as a heavy armoured car with both armour and armament equivalent to that of a cruiser tank and, in fact, used the 2-pdr turret of a Valentine tank. 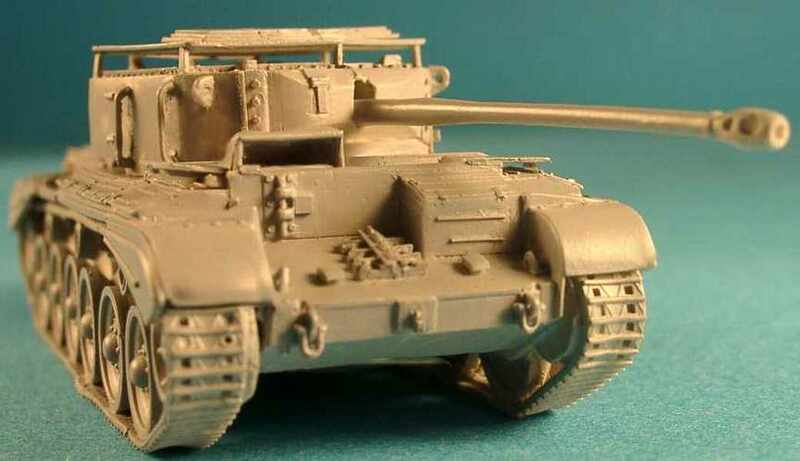 This private venture was successful and 122 of them were built, many being sent to North Africa in 1942. 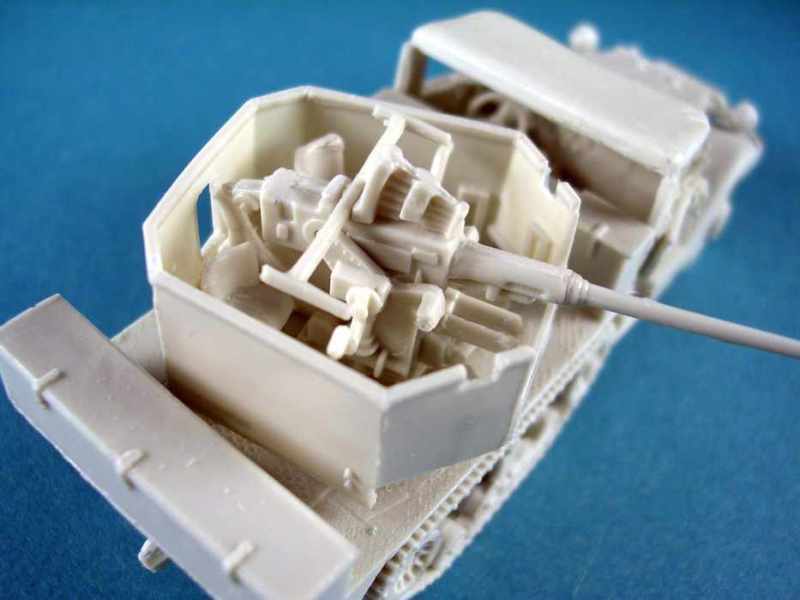 When British tank armament increased, the A.E.C. 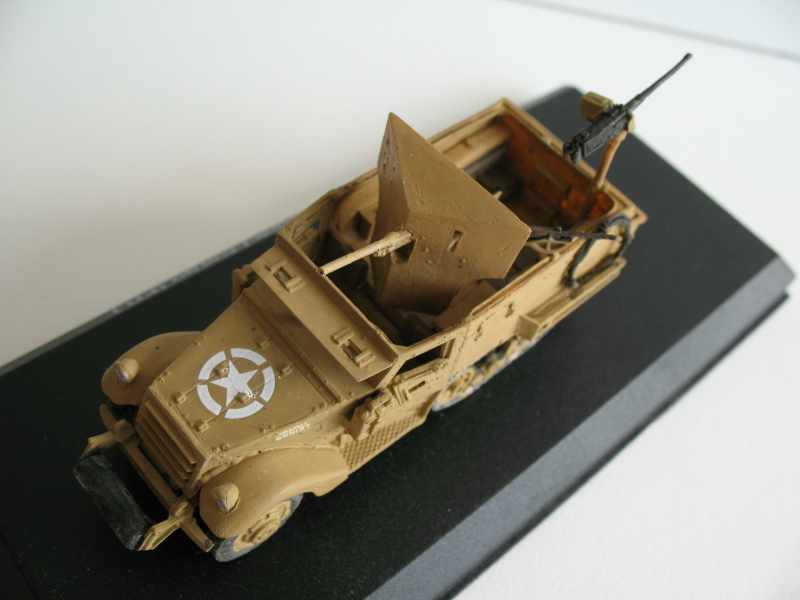 Mark II Armoured Car was designed to use the 6-pdr gun. 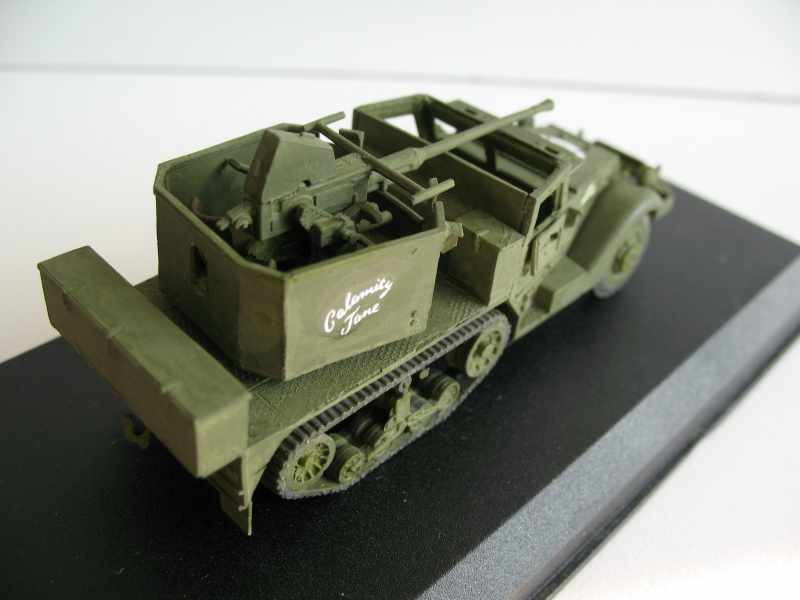 The Mark II had a more powerful diesel engine. 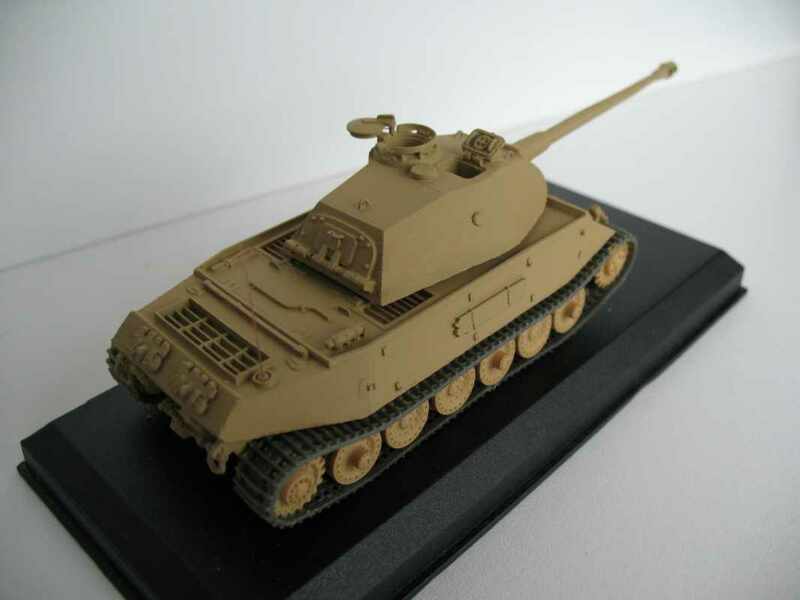 This model represents the rare A33 "Excelsior". 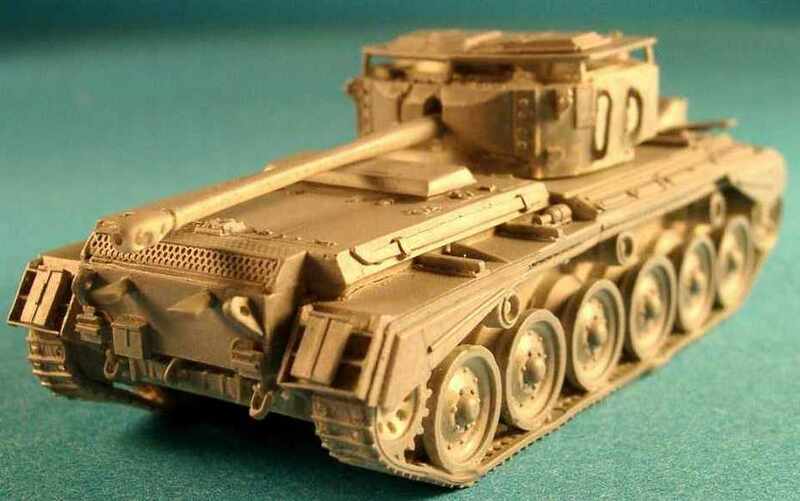 Only two versions of this Heavy Assault Tank were built with the only survivor on view at the Tank Museum at Bovington, England. 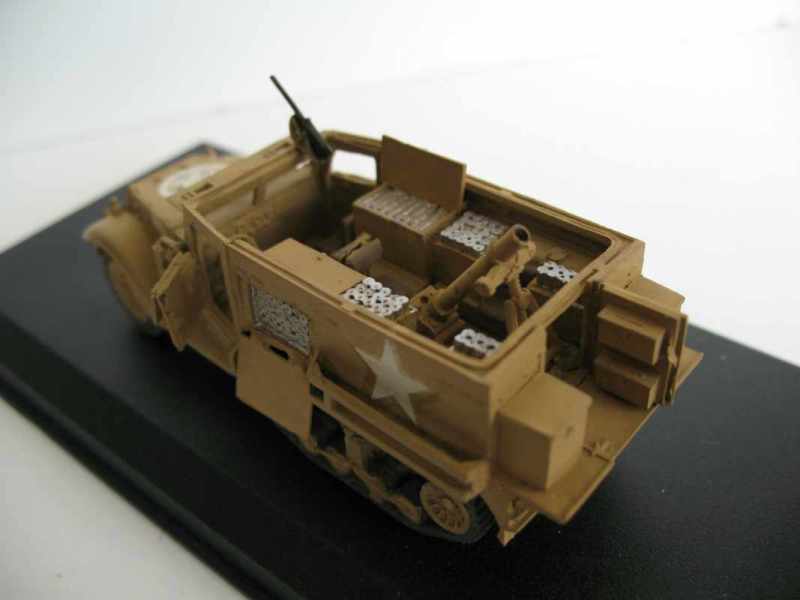 Our model is based on this unique vehicle which has American M6 Tank tracks. 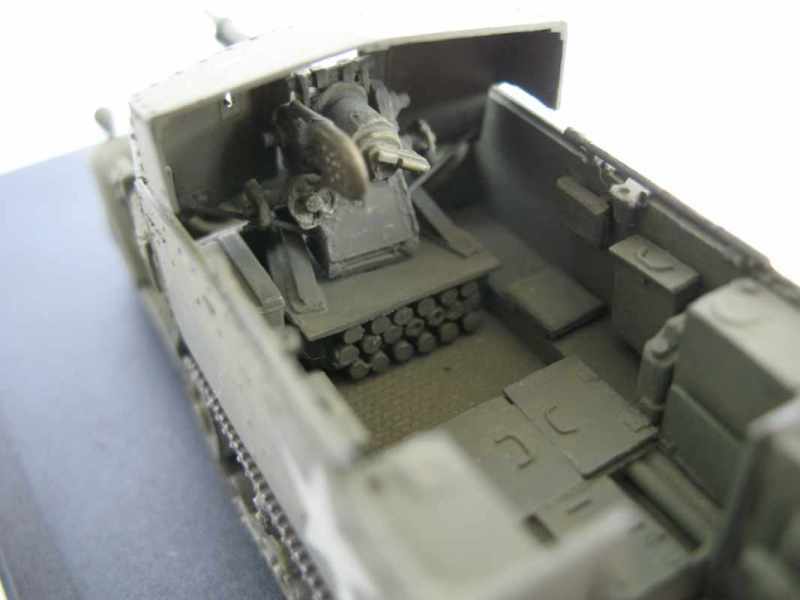 This was another attempt to mount the 17pdr. 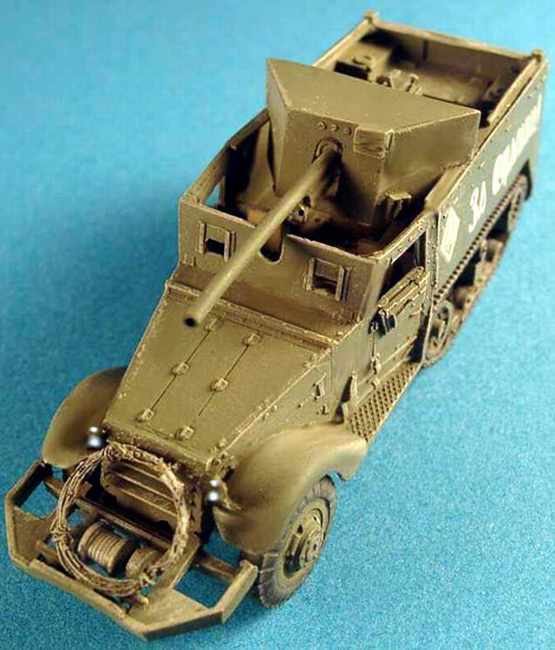 anti-tank gun in a self propelled chassis, but the success of the Archer and the availability of US M10, meant that production priority at Vauxhall was given to the A34 Comet and although the first pilot model was ready in 1944 and production continued throughout 1945, the 230 built were notfinally completed until 1946 and although they were used by the BAOR in Occupied Germany, they never saw combat. 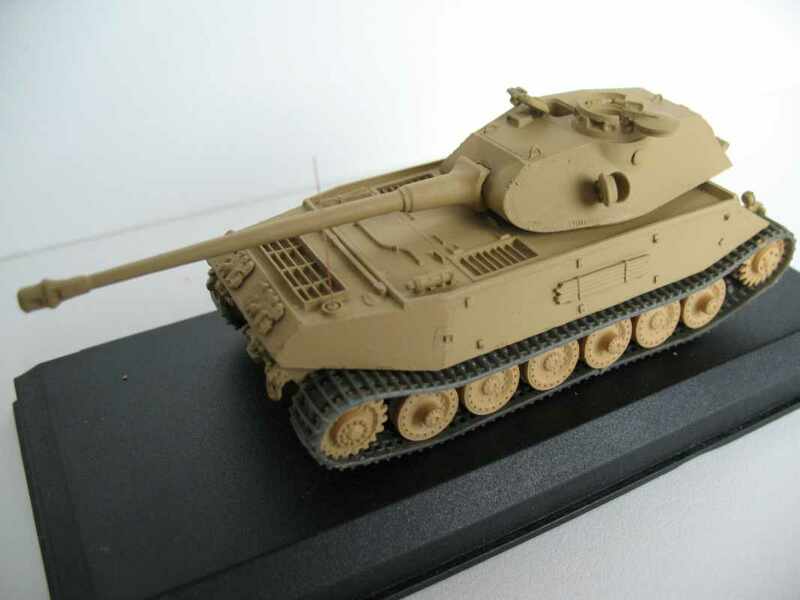 The master model was completely upgraded in Sept. 2002 and is a fine representation of this rare AFV. 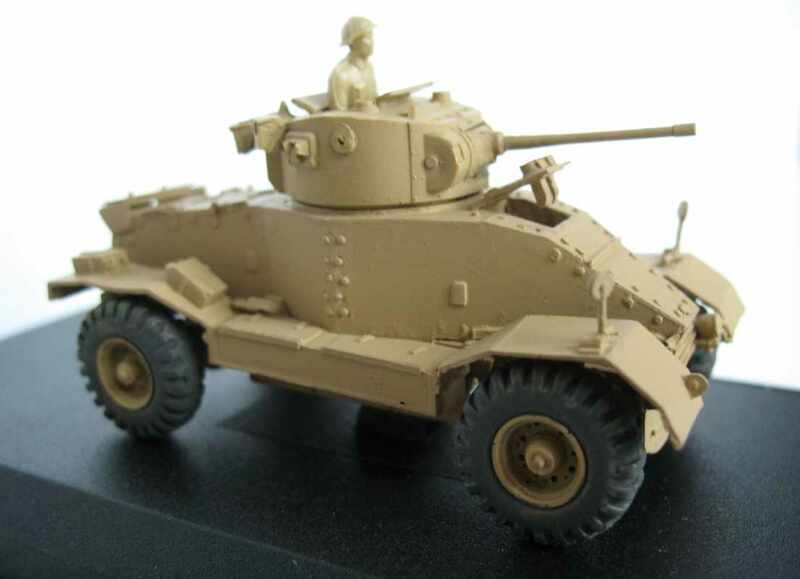 Due to continuing delays in the production of the A30 Challenger (Kit UK23), and as the A41 Centurion design work had just begun, it was decided that Vauxhall should build an interim 17pdr. 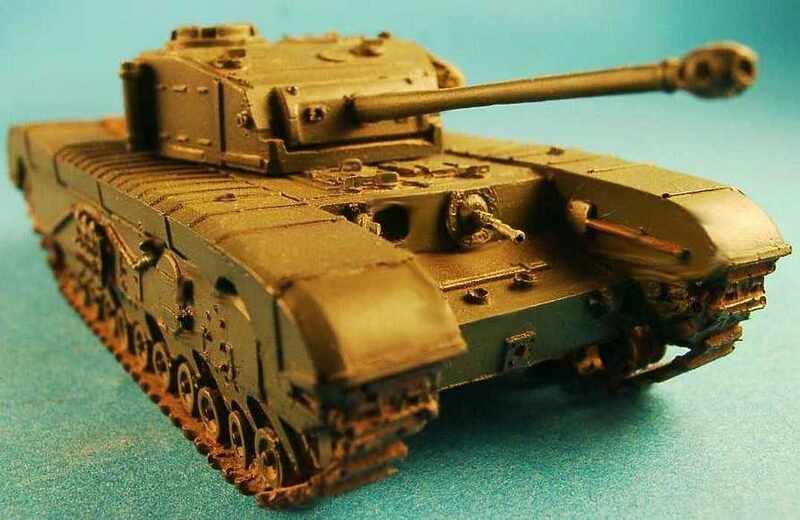 Gun Tank using many of the components of the A22 Churchill Mk.VII resulting in the A43 "Black Prince" or "Super Churchill". 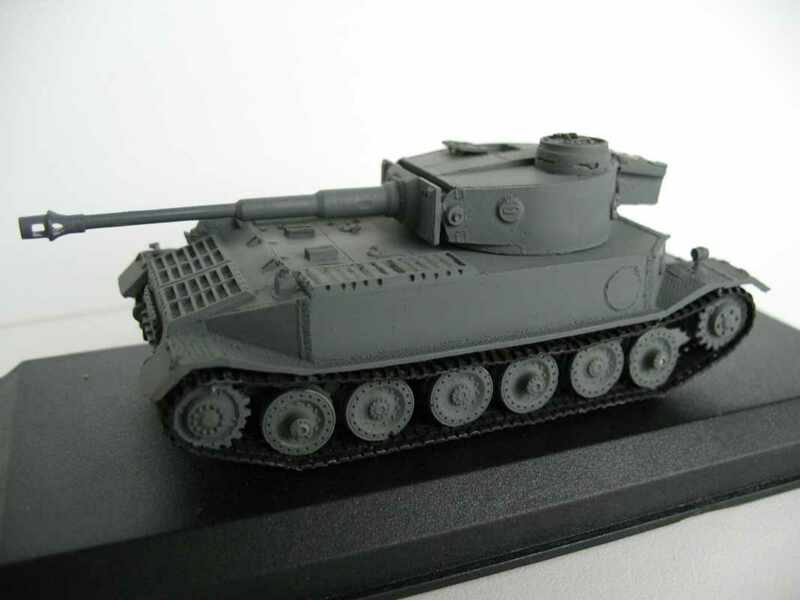 Six were completed before wars end, but as the Centurion was also now ready no series production was undertaken. 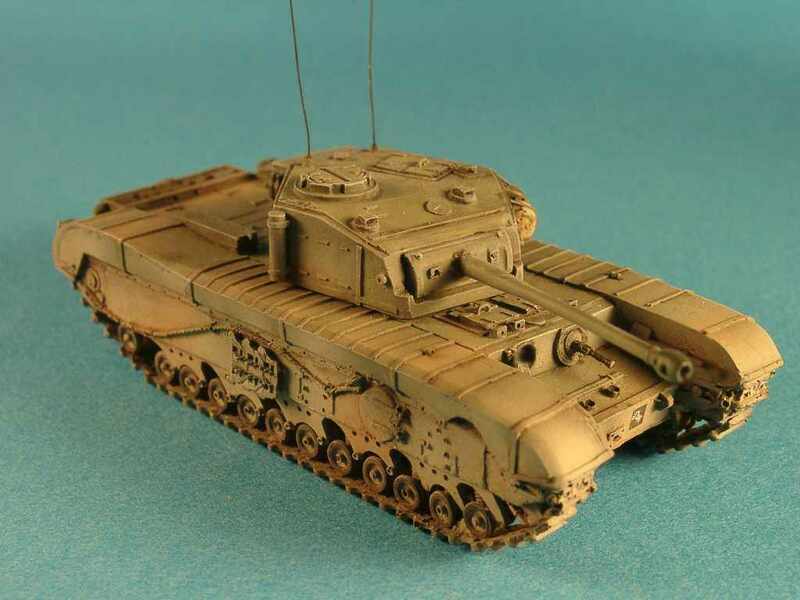 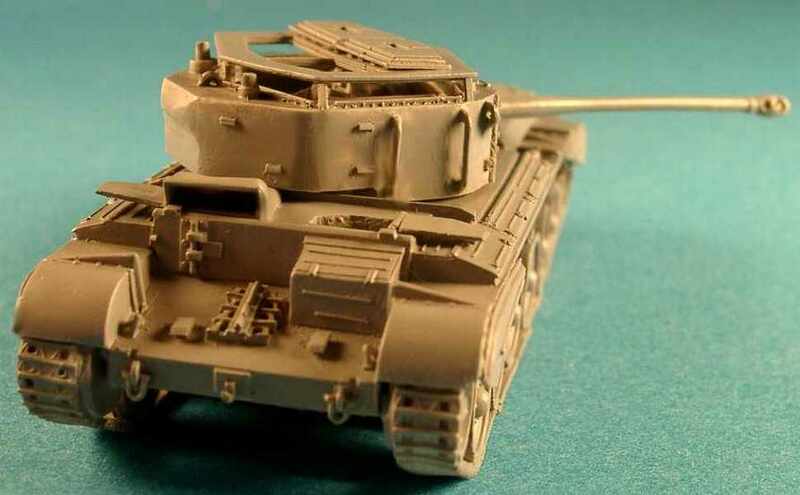 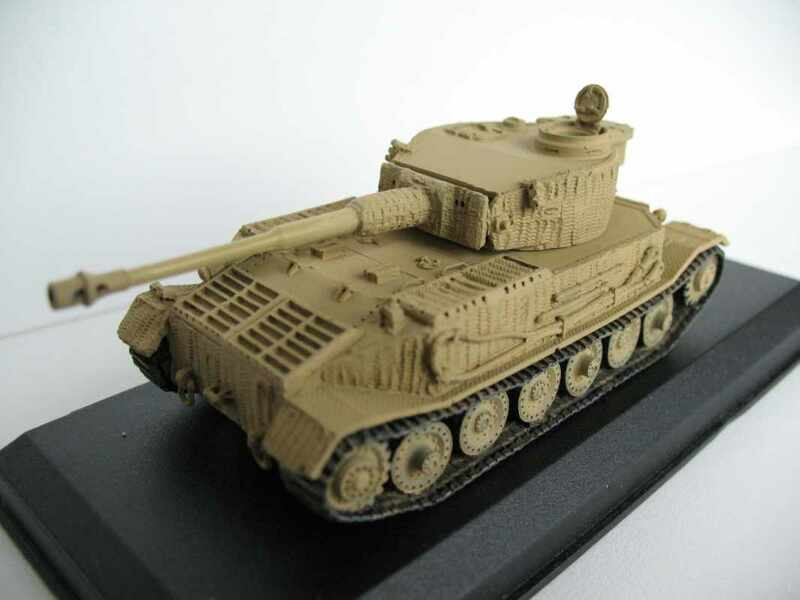 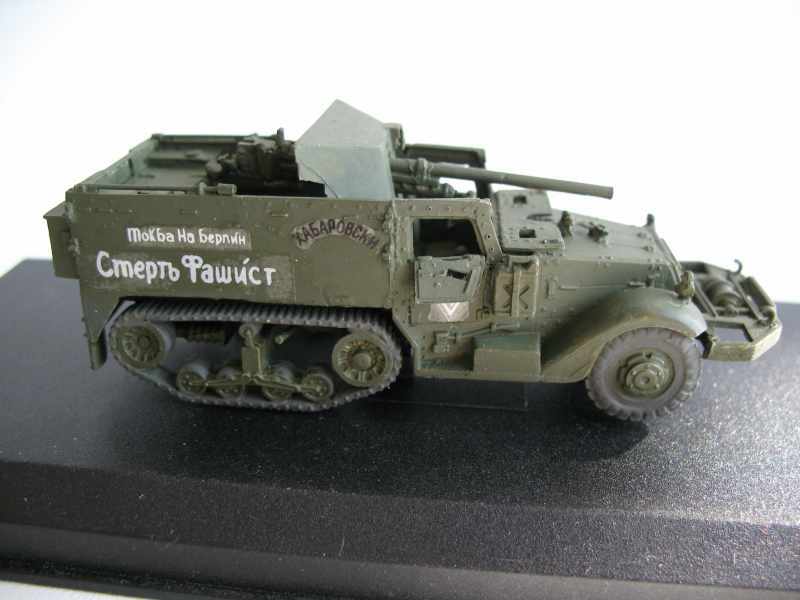 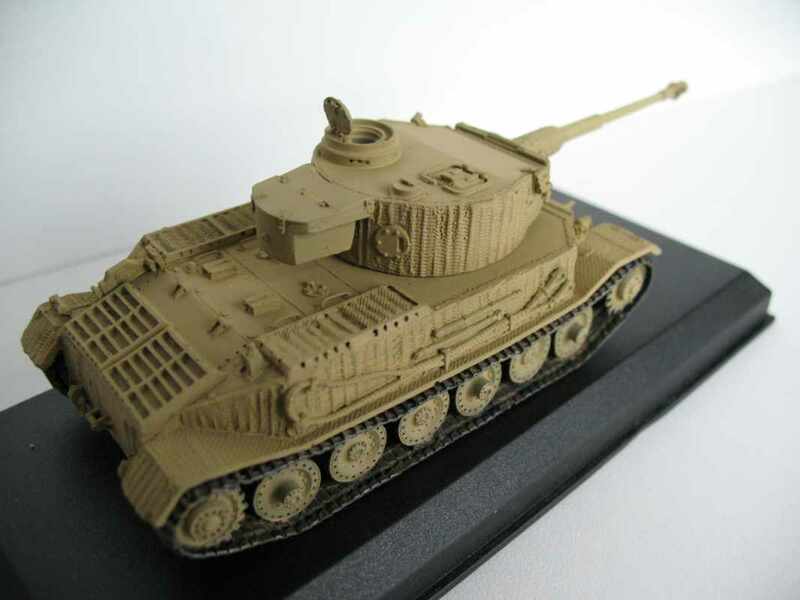 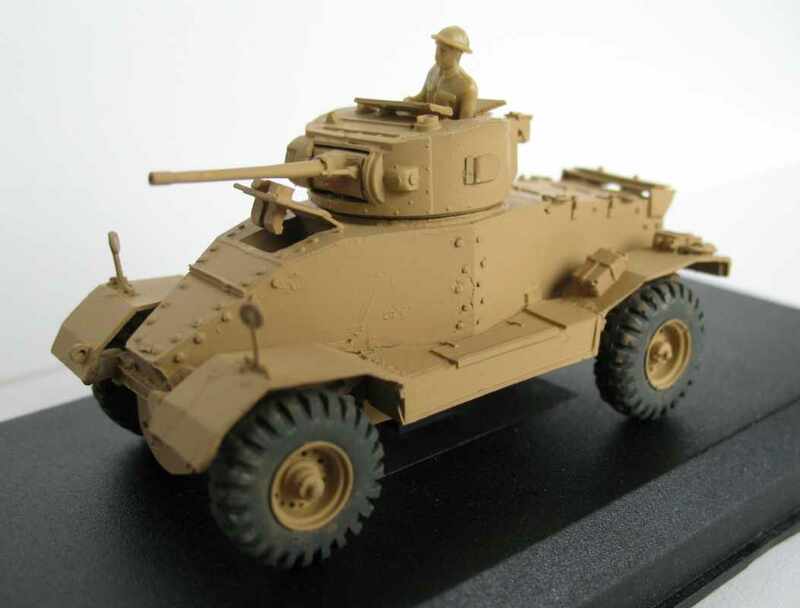 The master model for this kit was completely rebuilt in early 2005 to match the other Churchill kits in the Milicast range, although the painted photographs shown are of the pre-upgrade version. 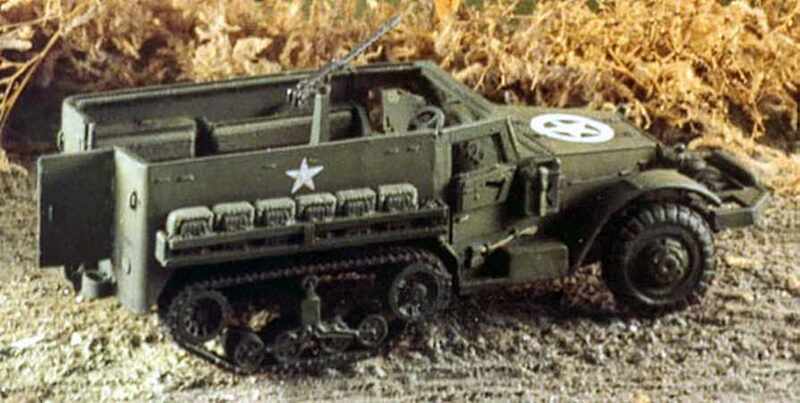 The US Halftracks were amongst the most widely used vehicles by the U.S. Army during the World-War II. 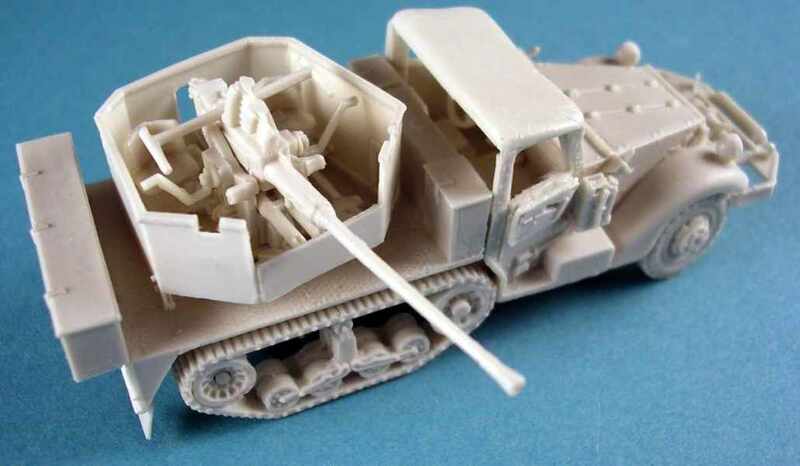 They are made by White, Diamond T, Harvester and other companies. 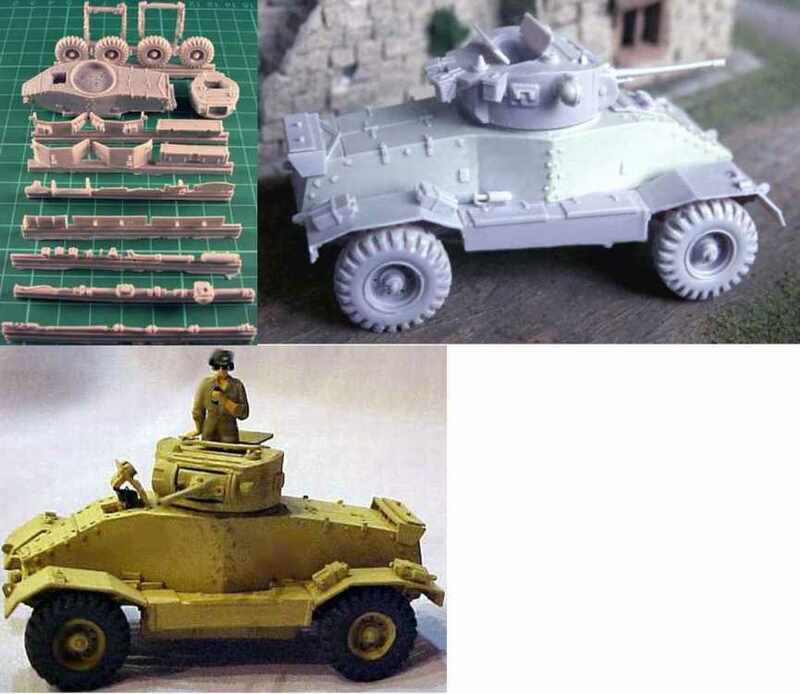 There are many variations and derivatives. 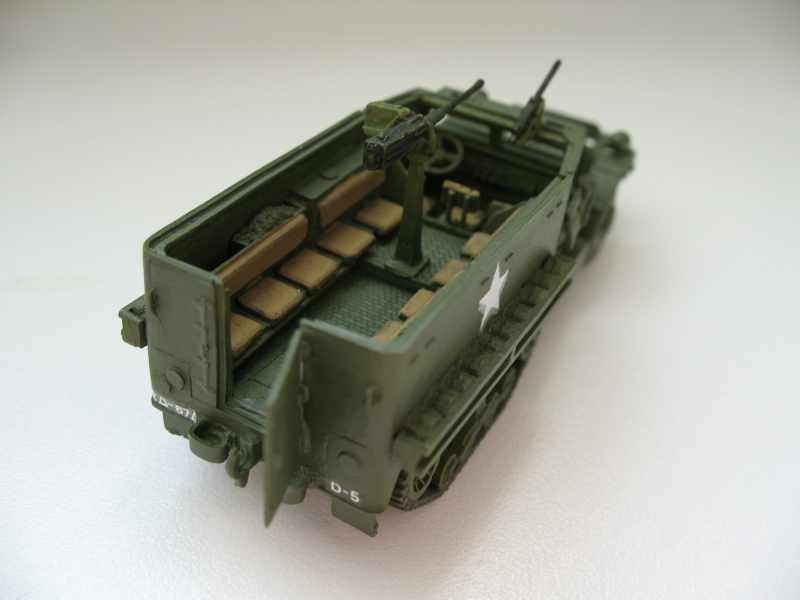 Pity enough, there are on the market a few US Halftracks in the 1/72 plastic scale. 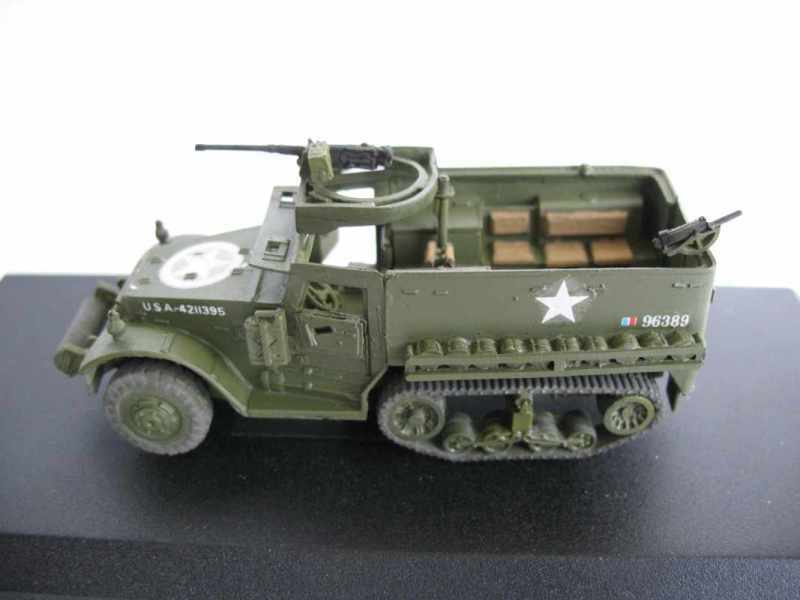 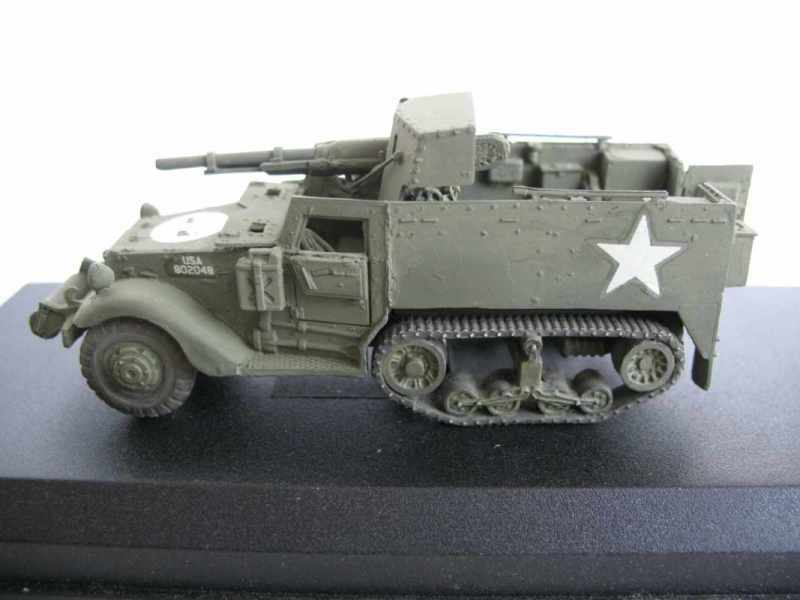 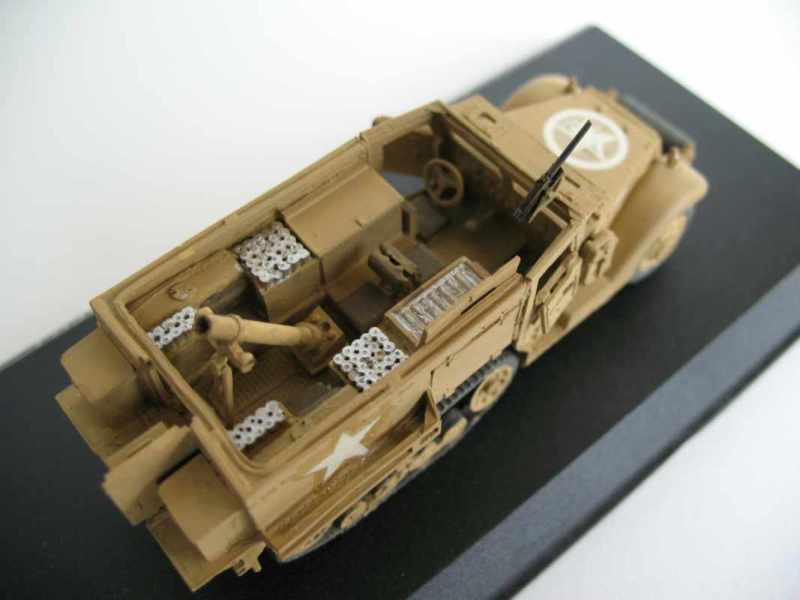 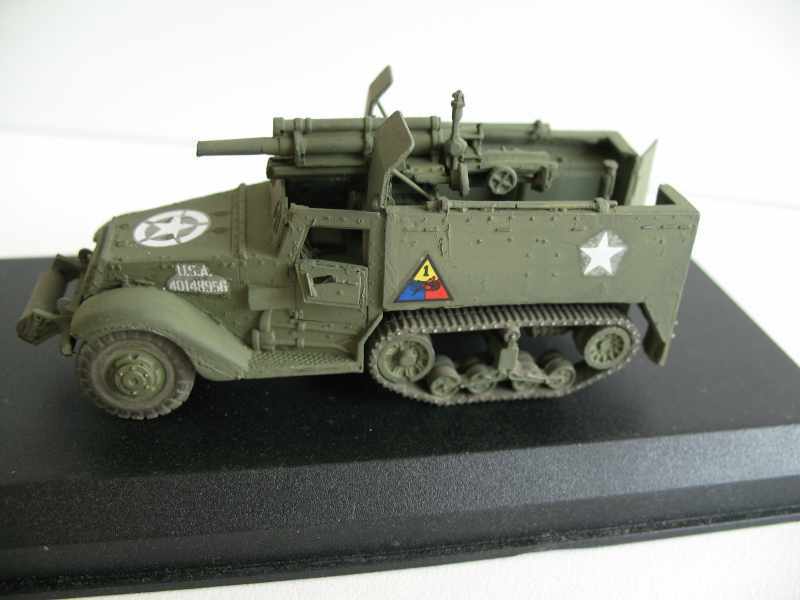 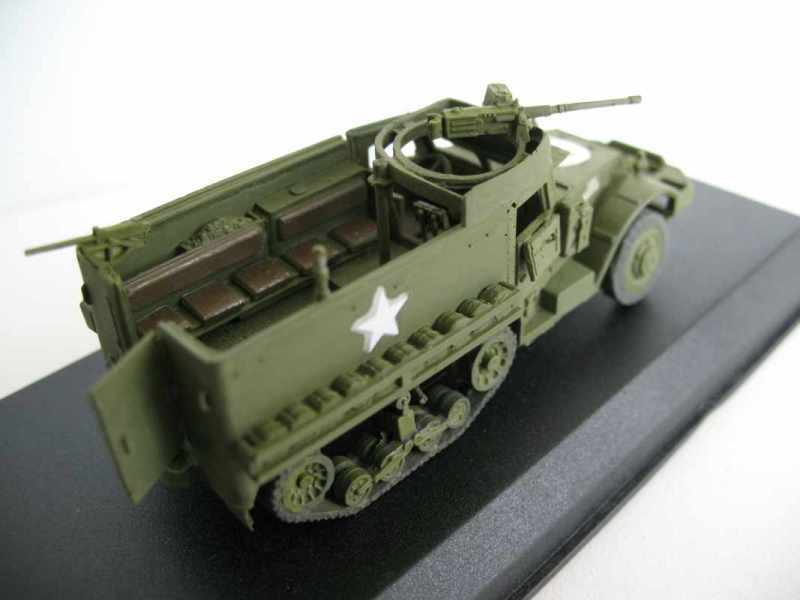 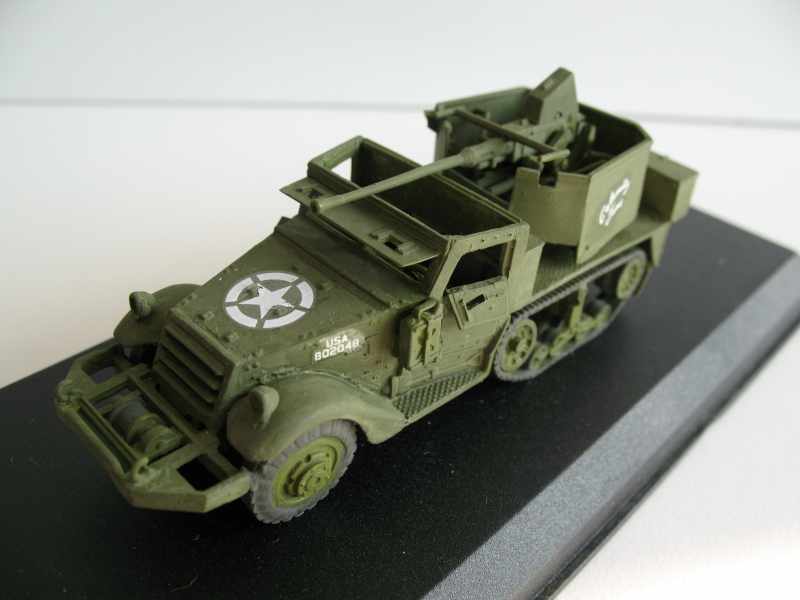 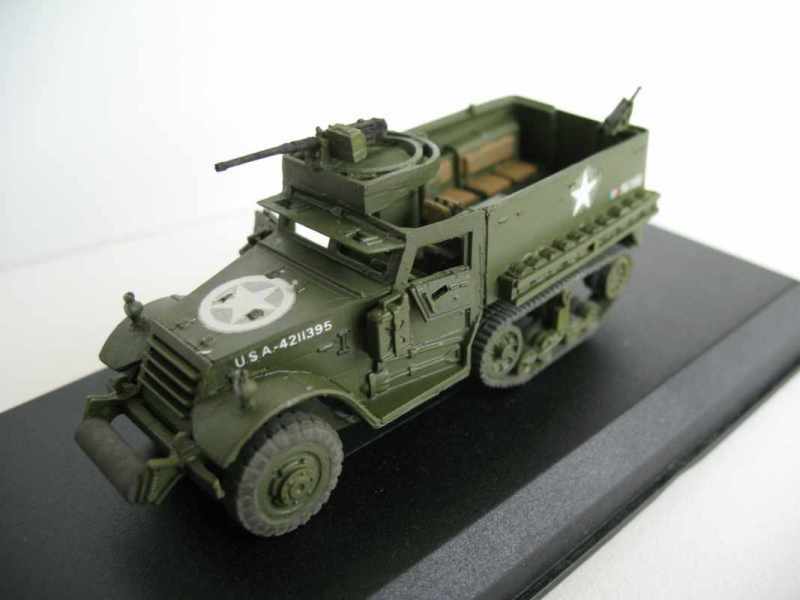 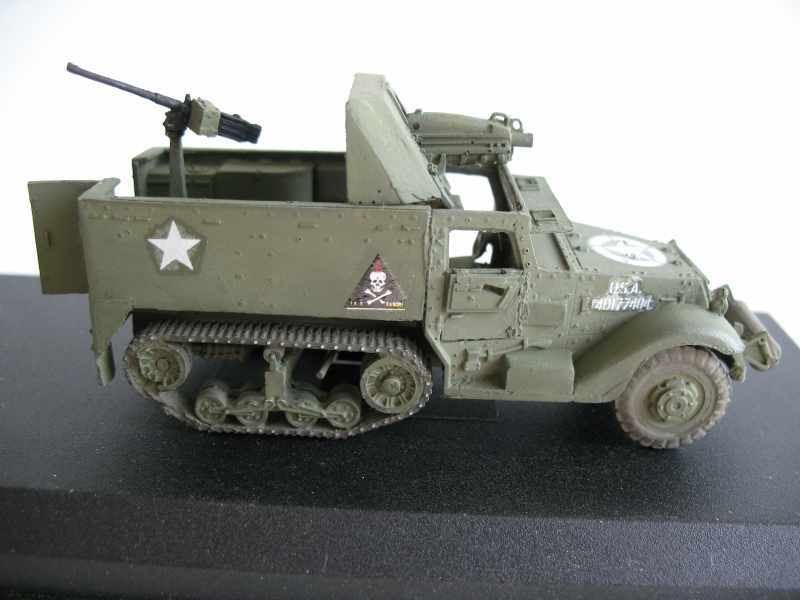 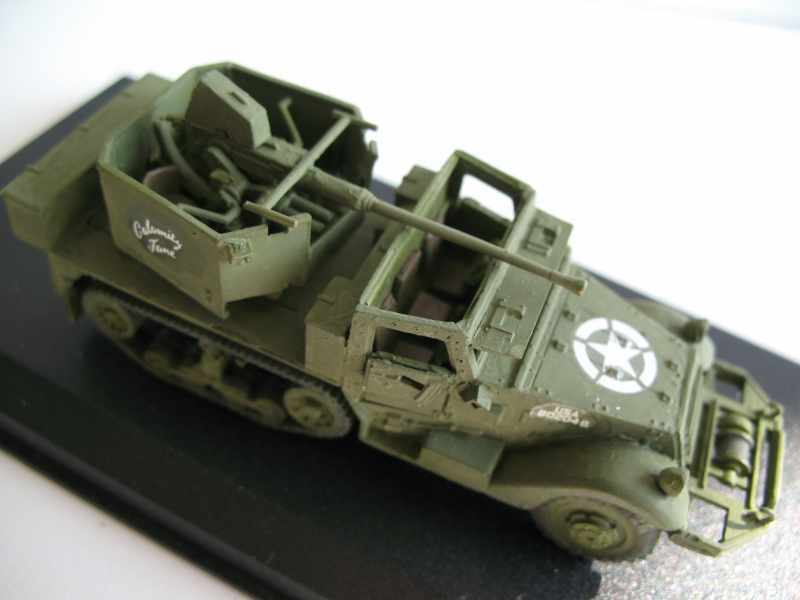 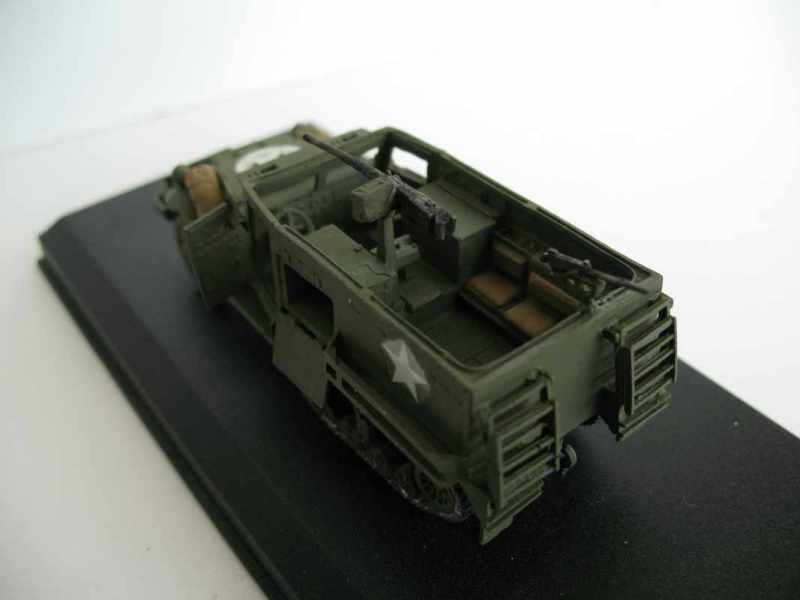 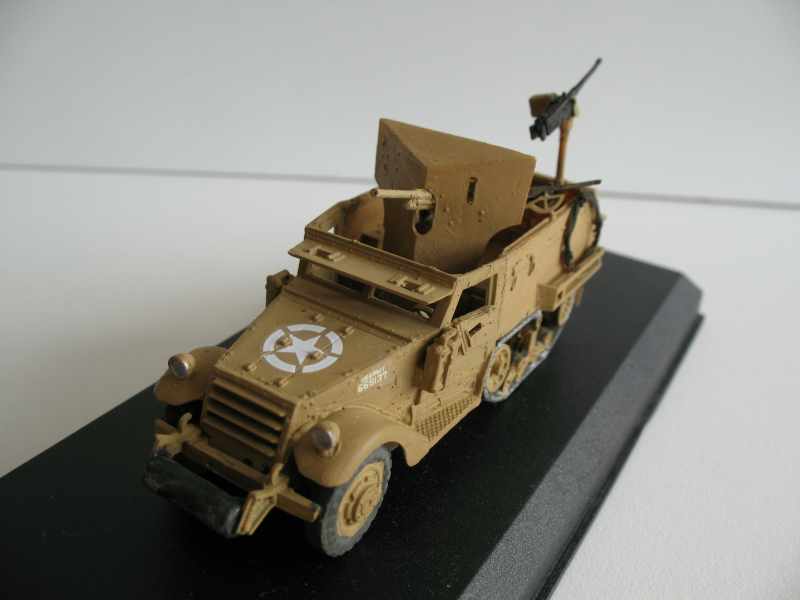 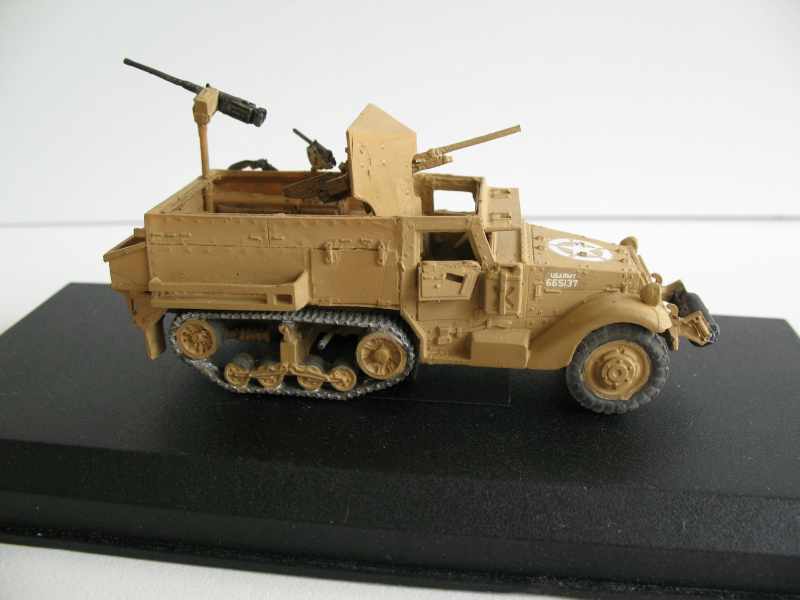 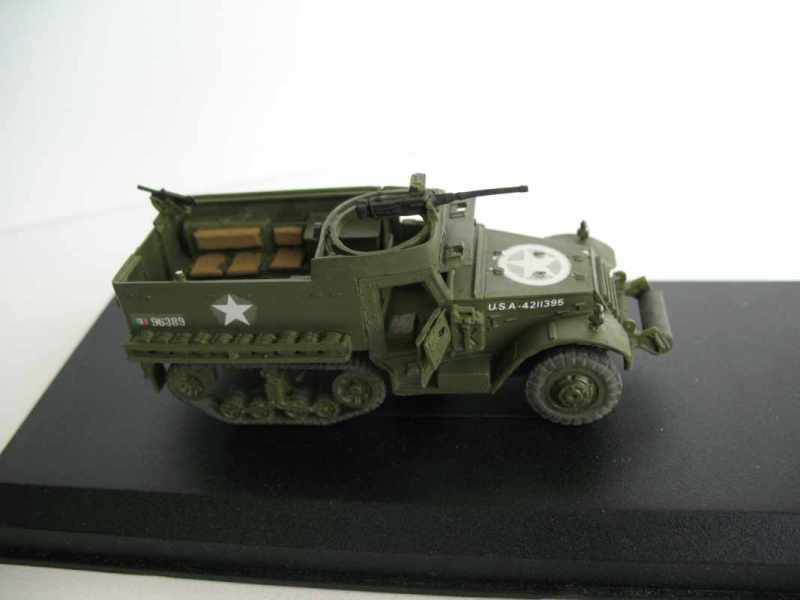 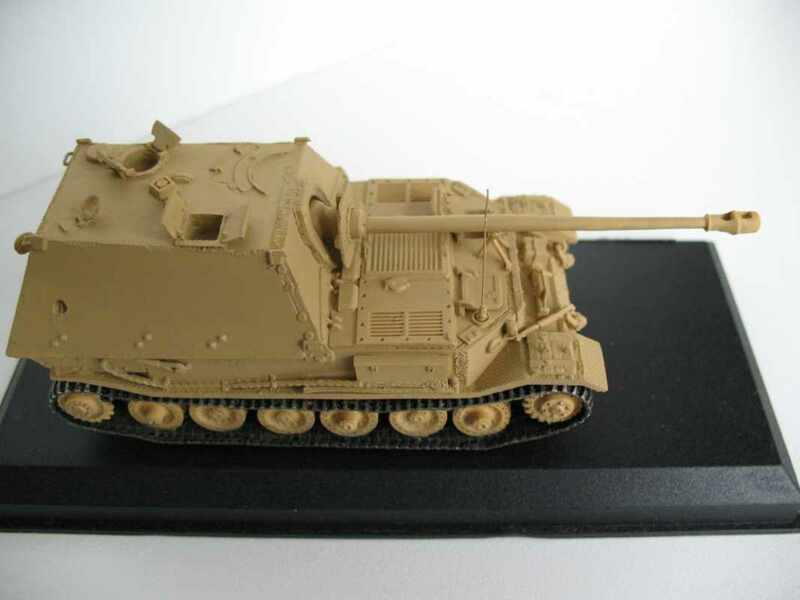 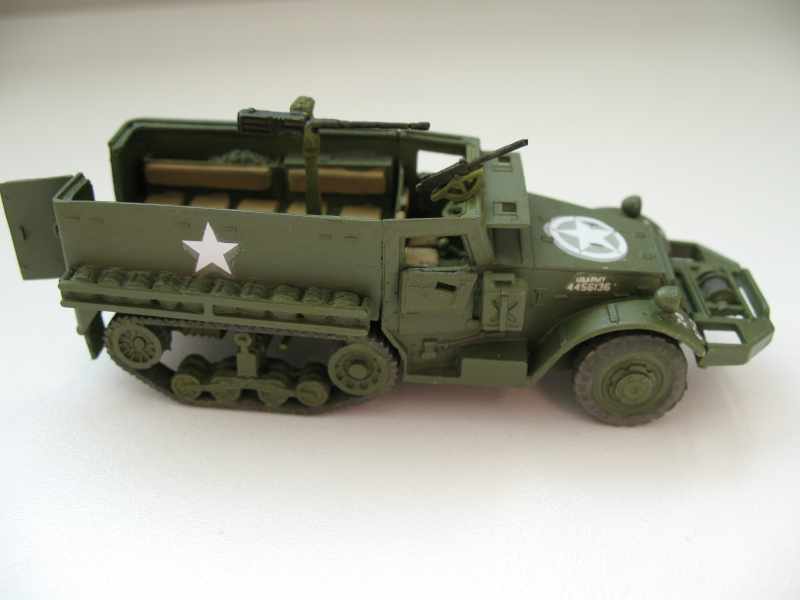 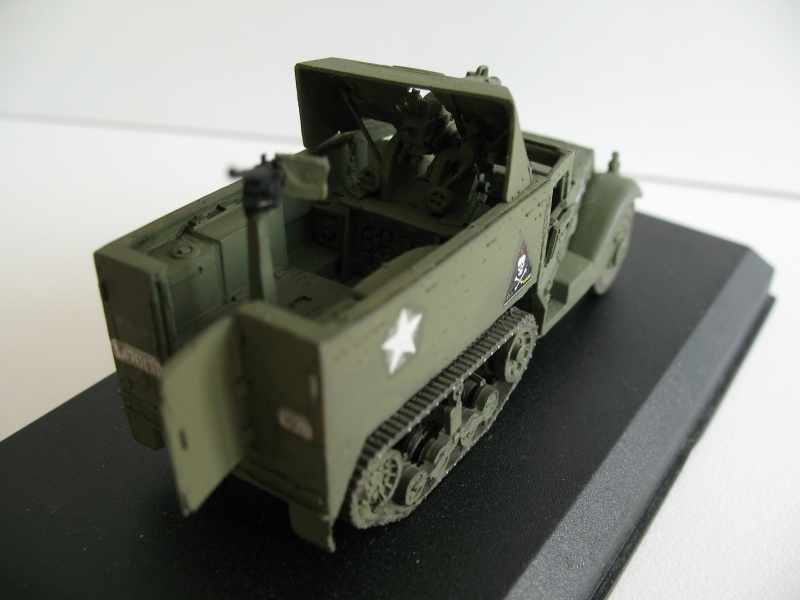 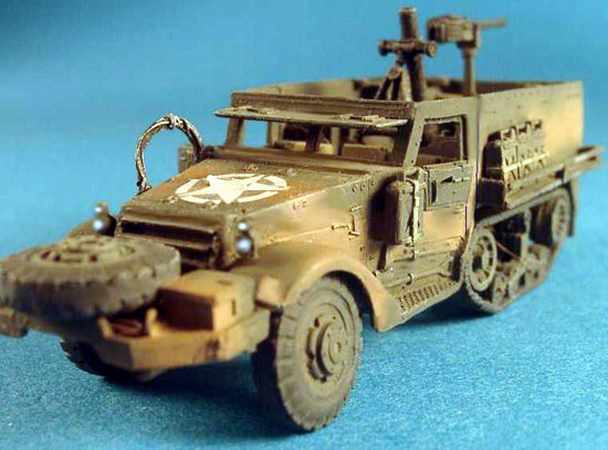 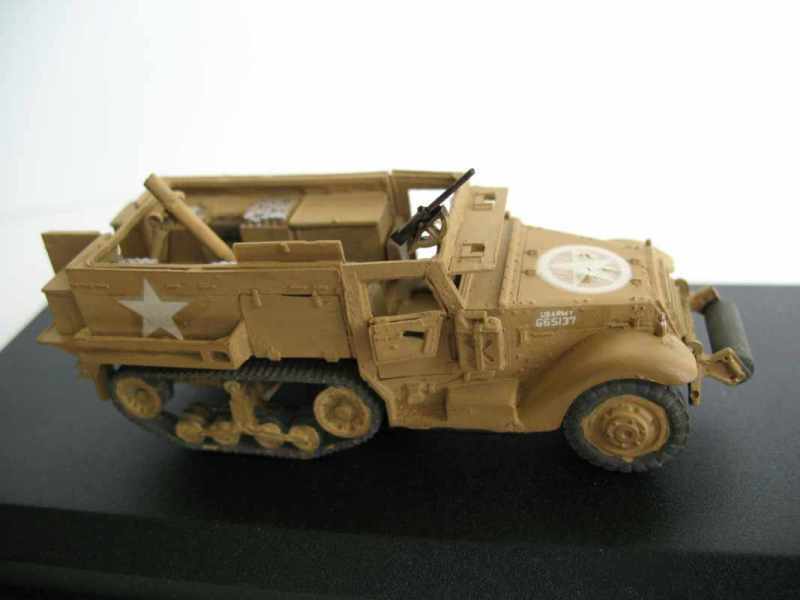 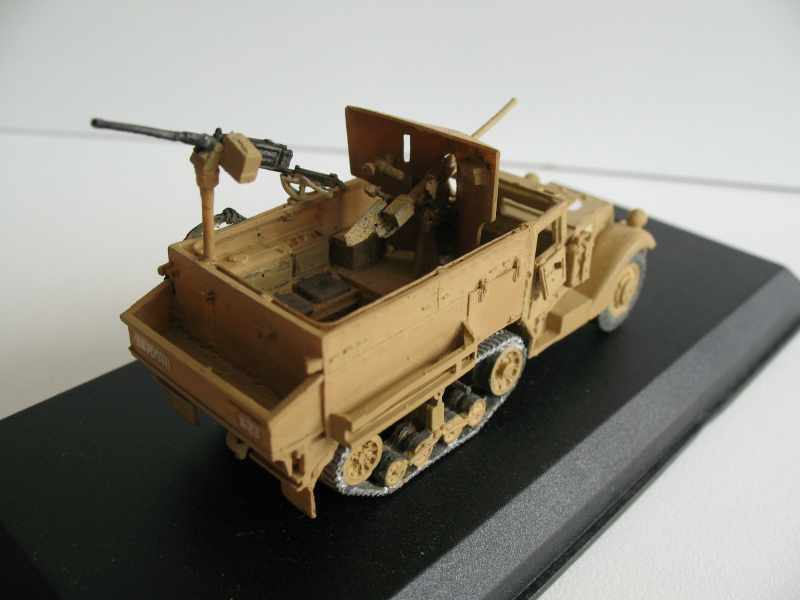 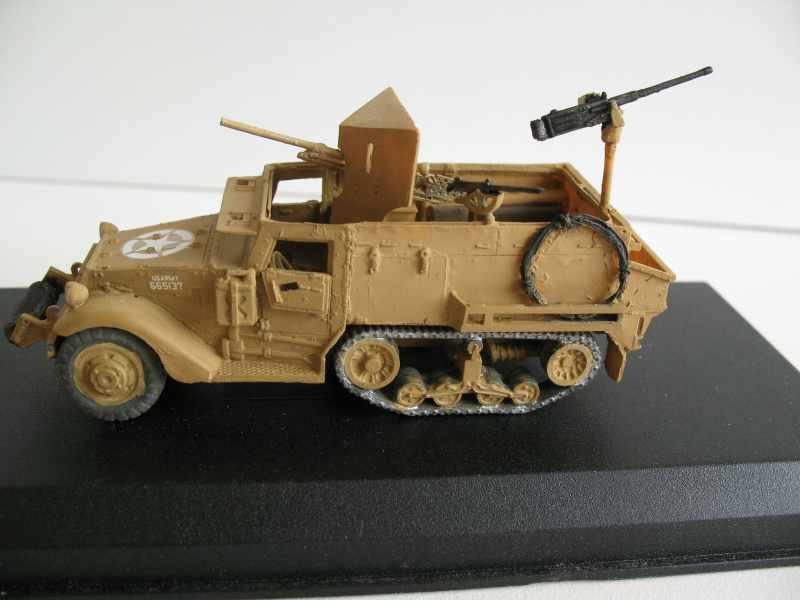 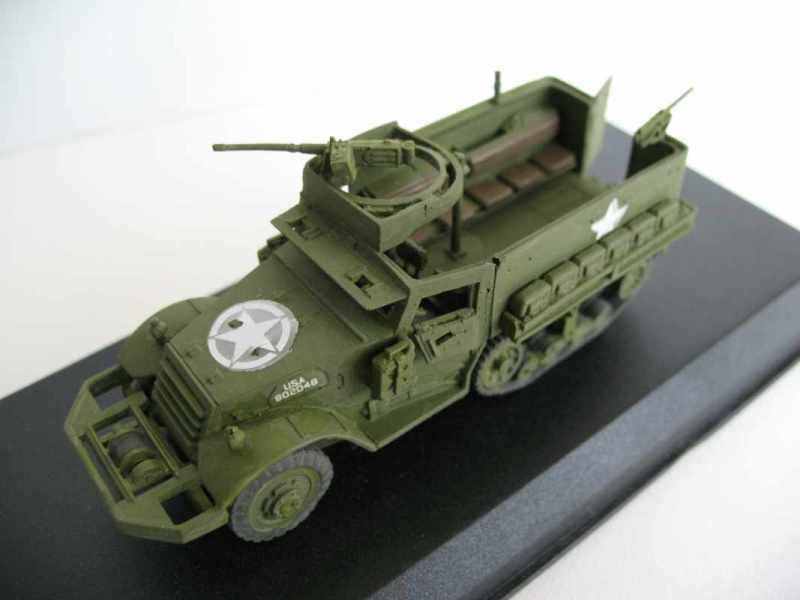 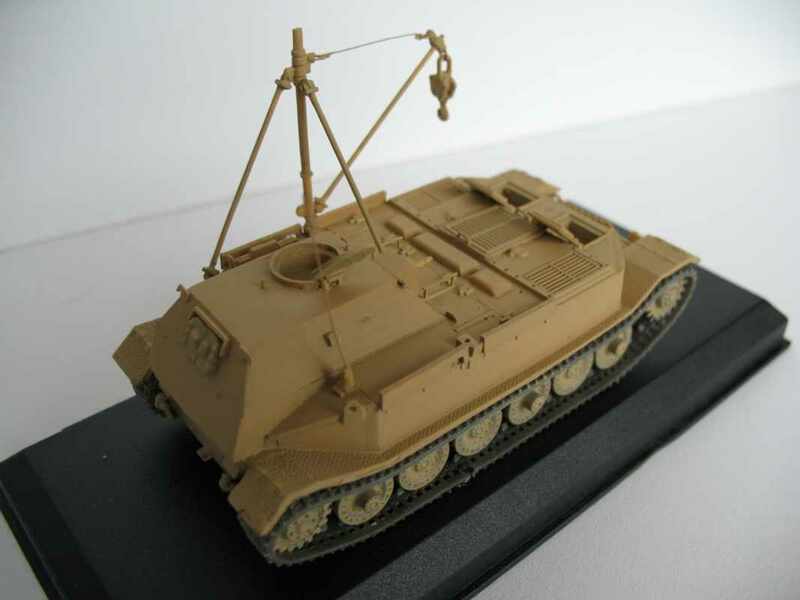 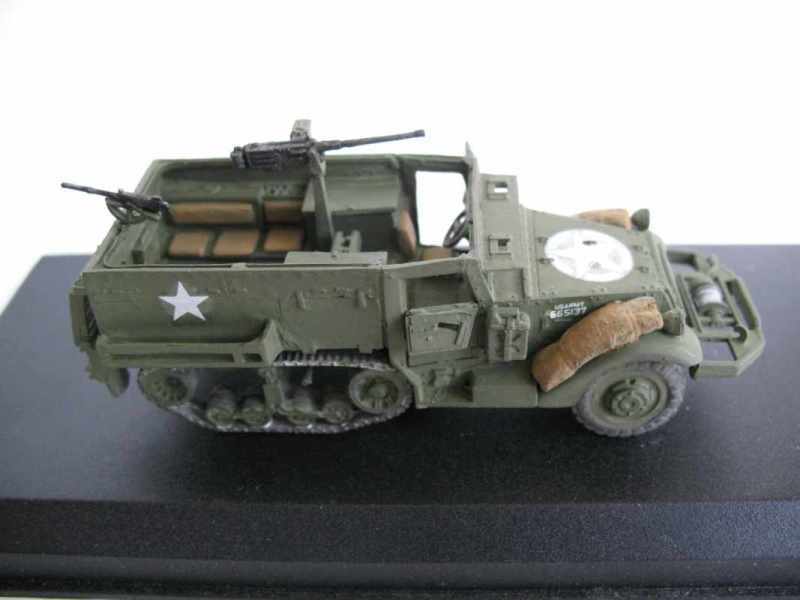 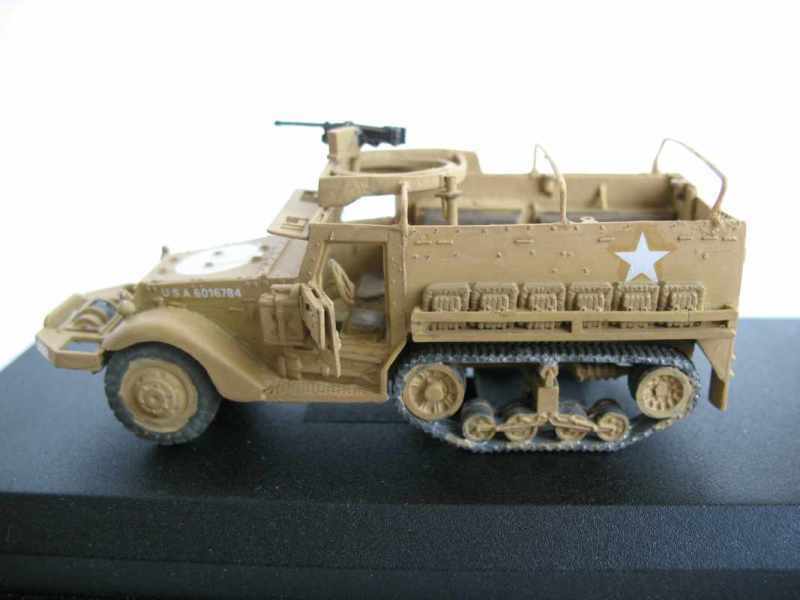 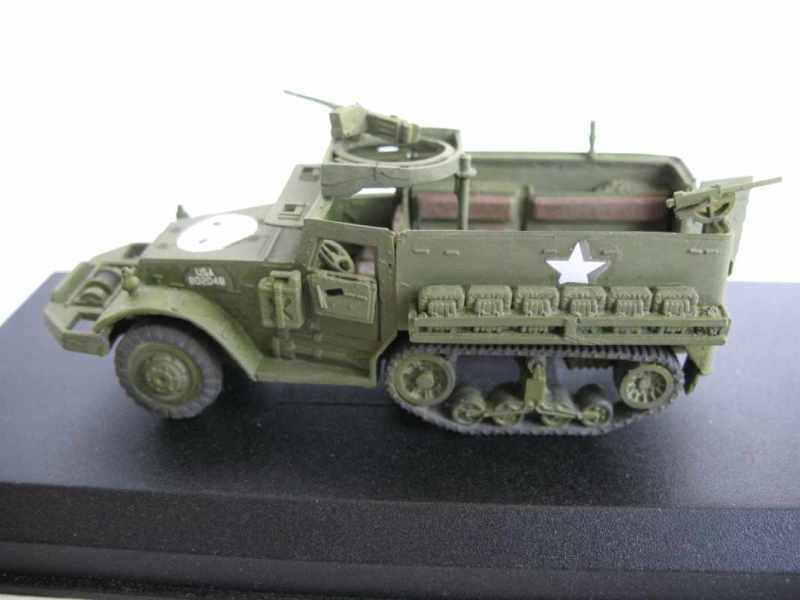 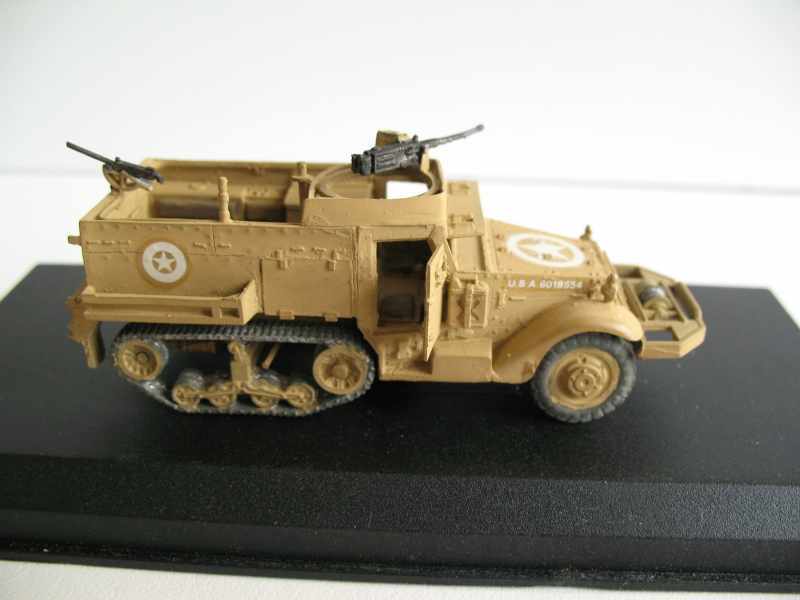 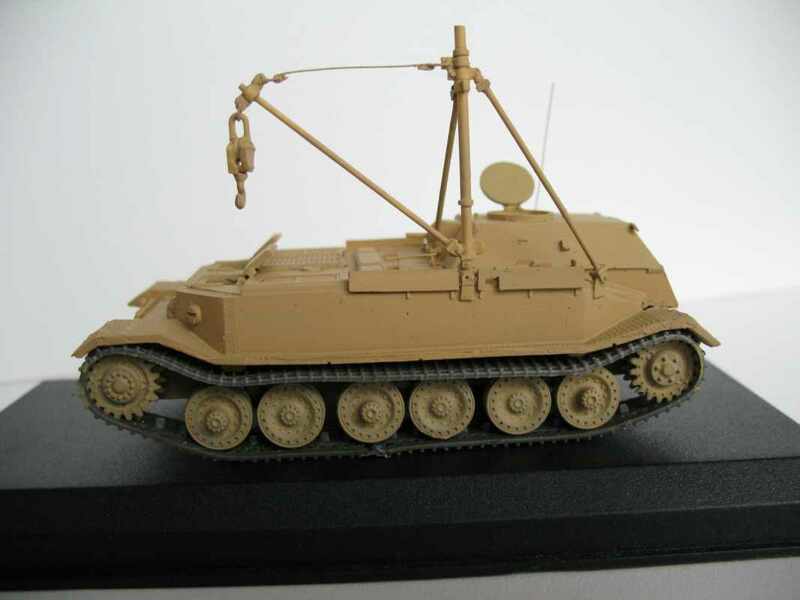 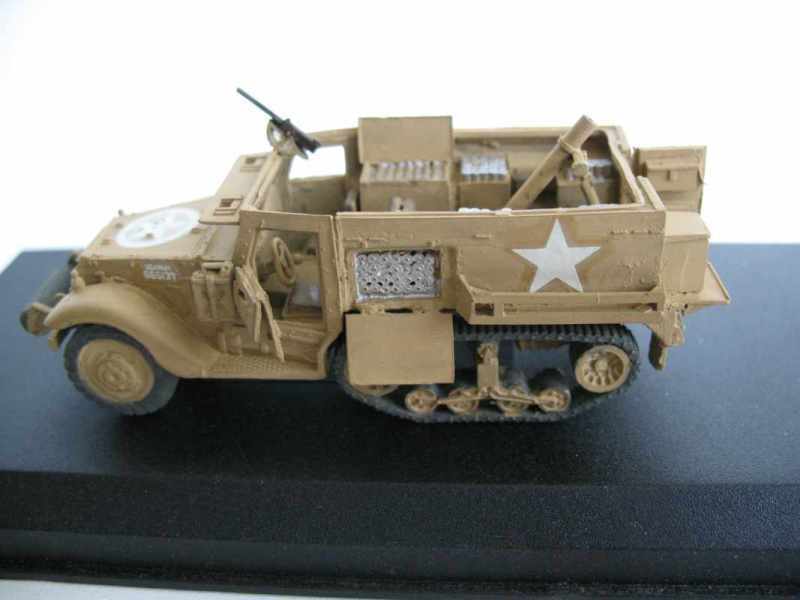 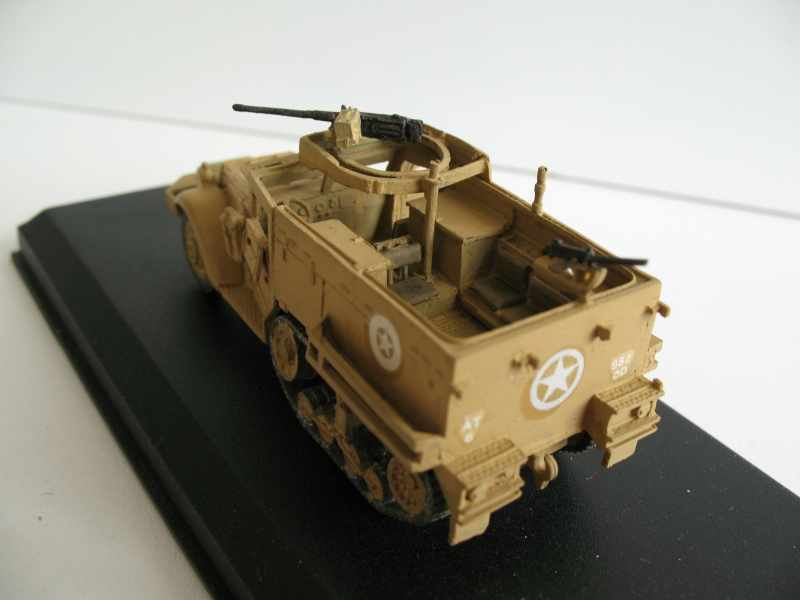 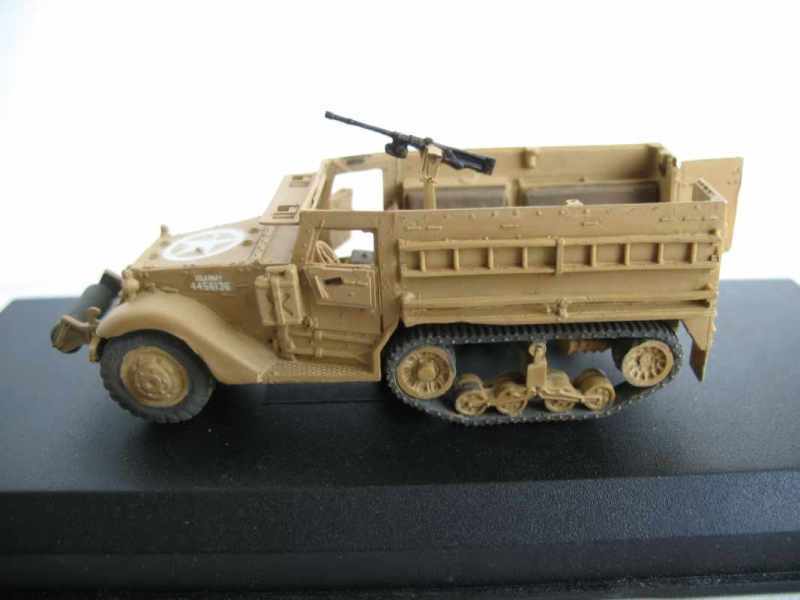 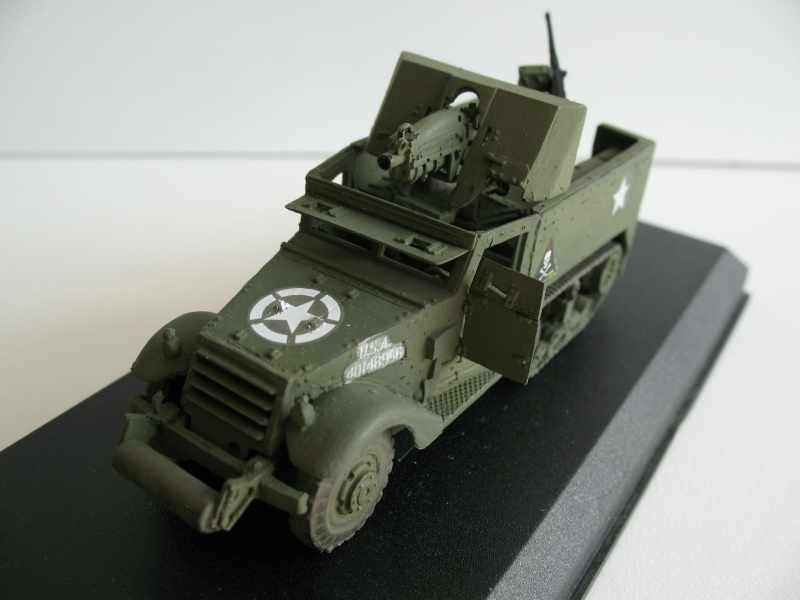 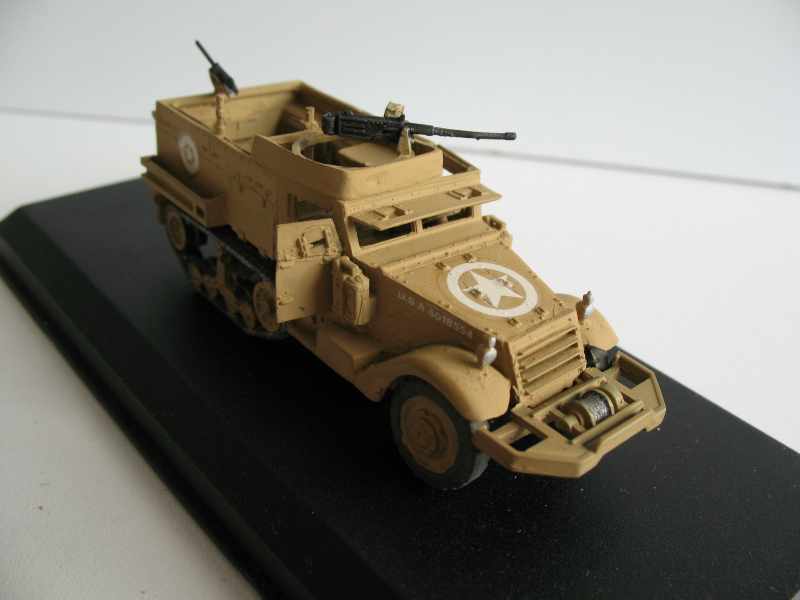 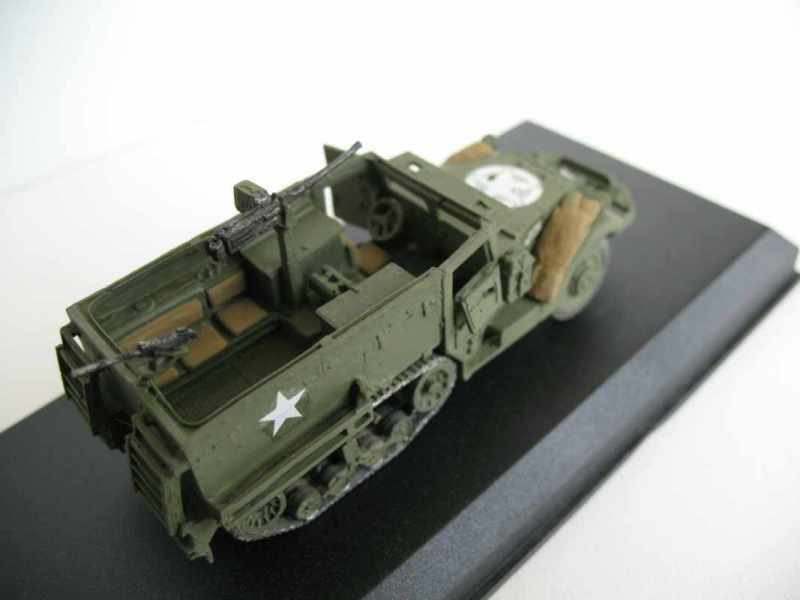 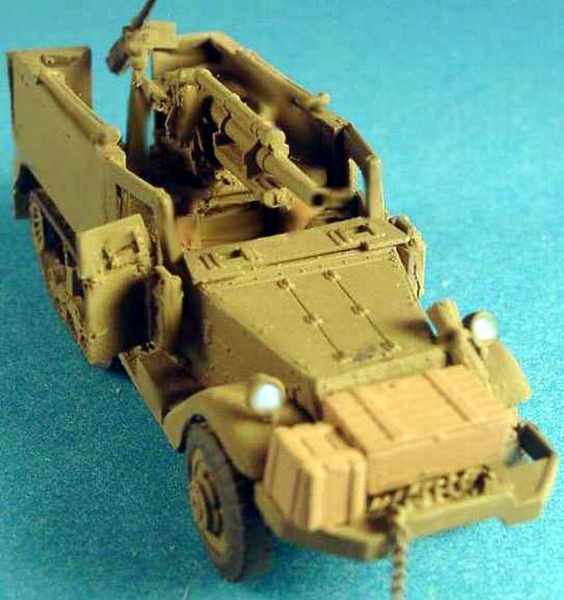 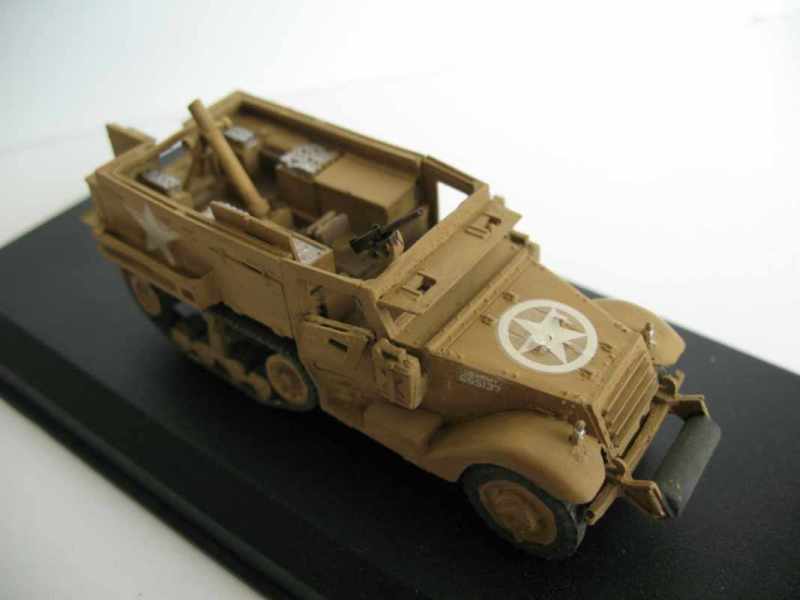 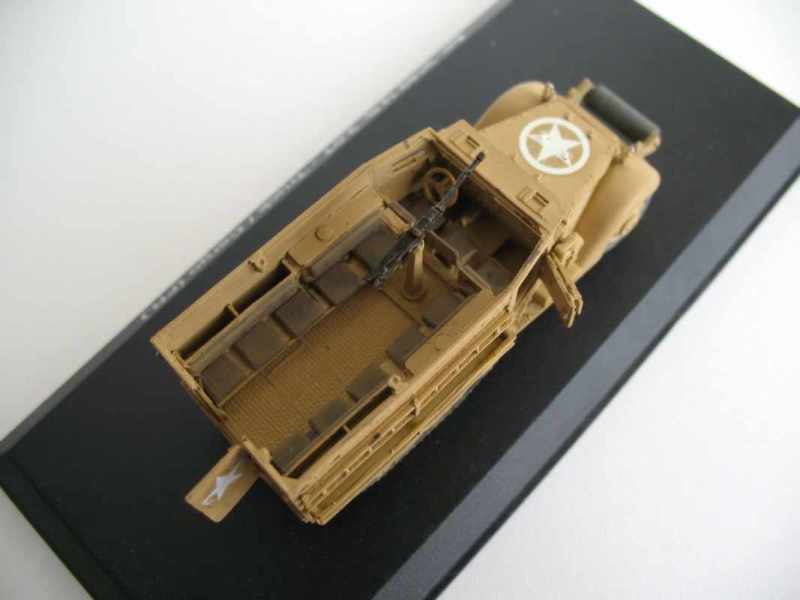 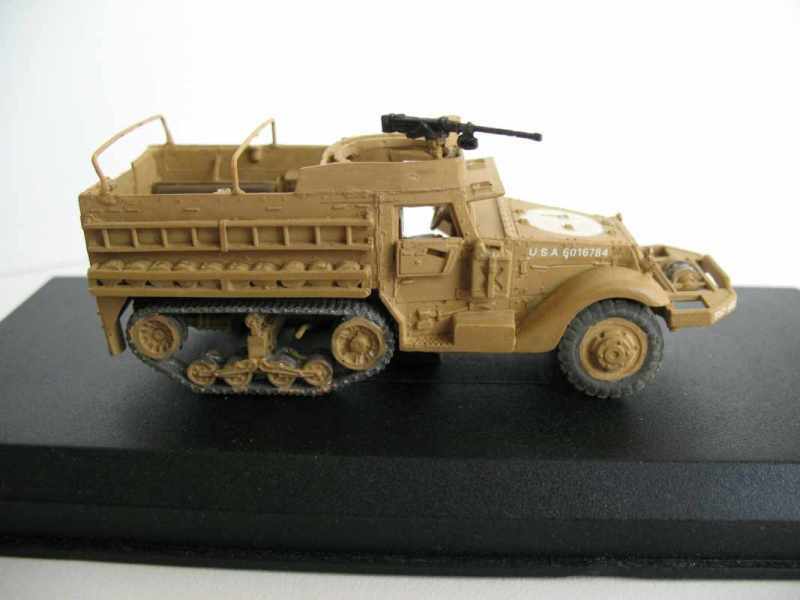 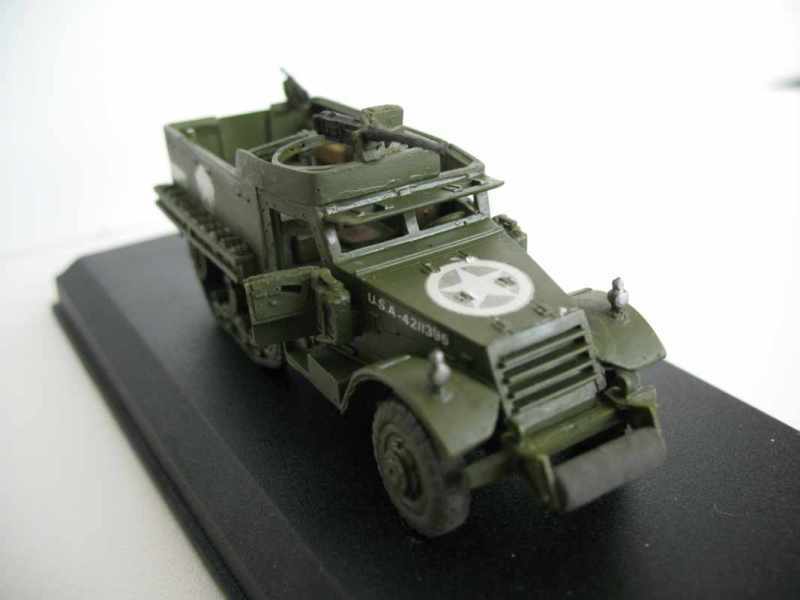 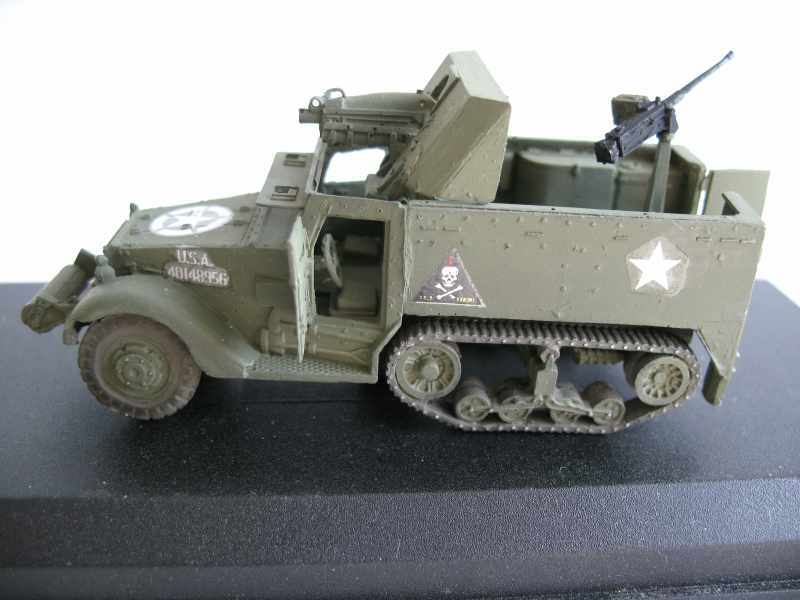 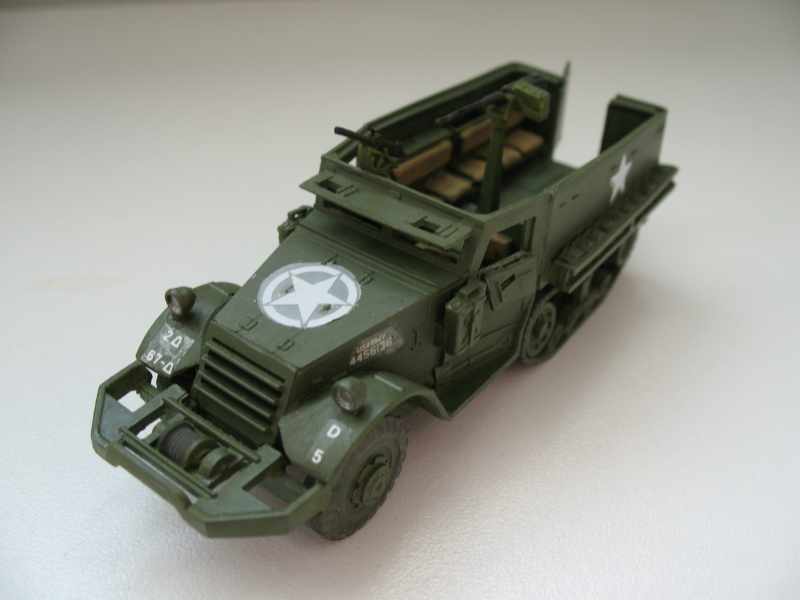 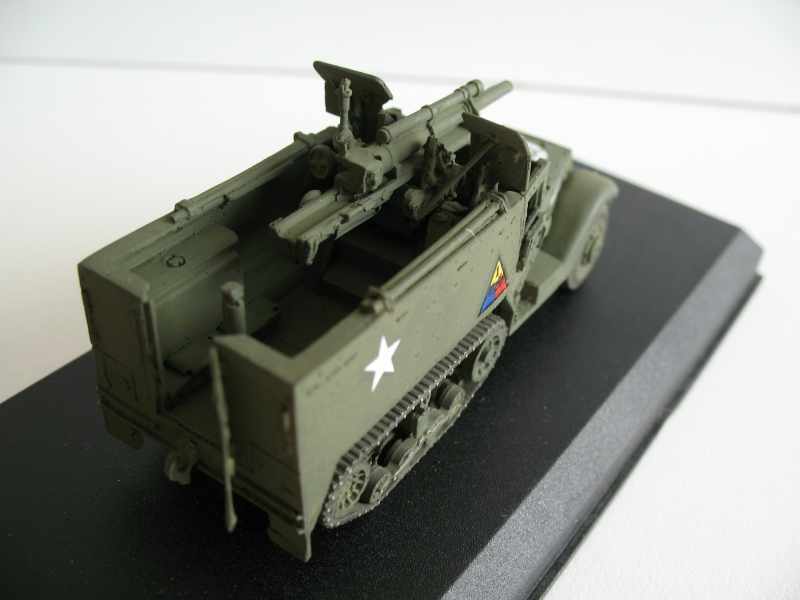 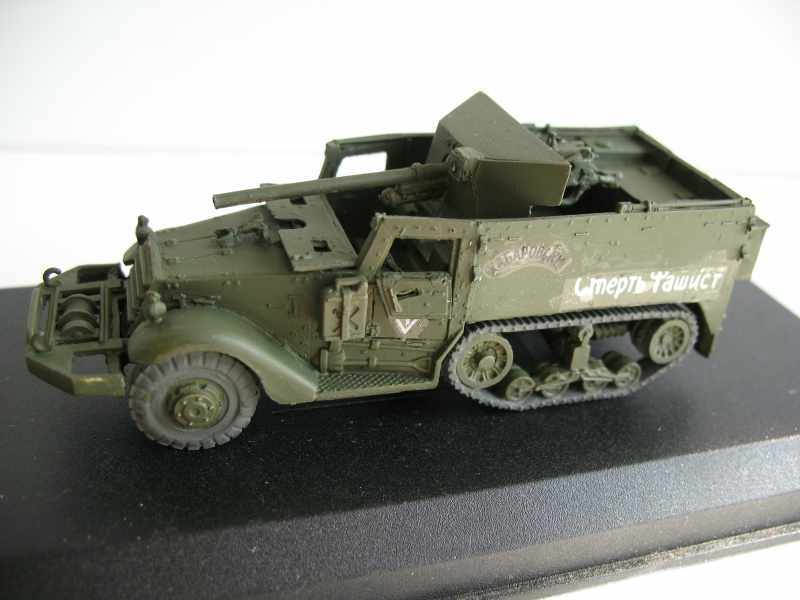 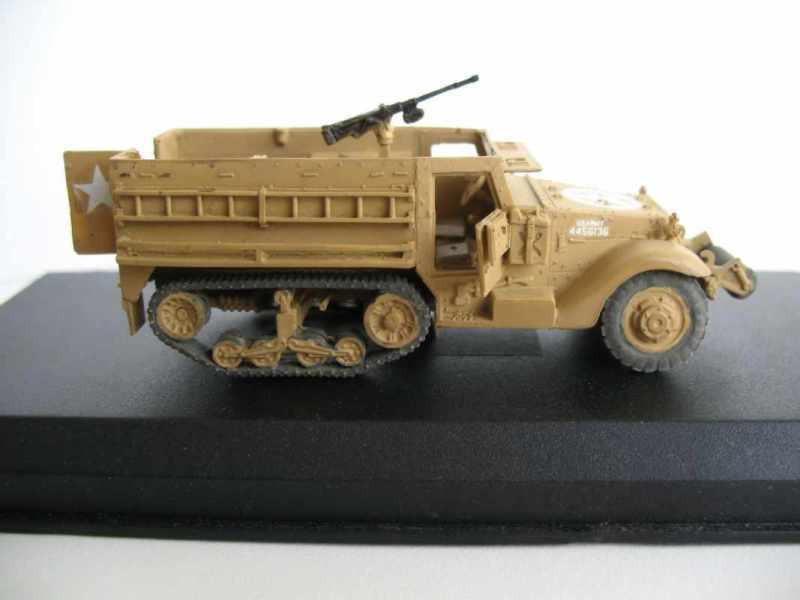 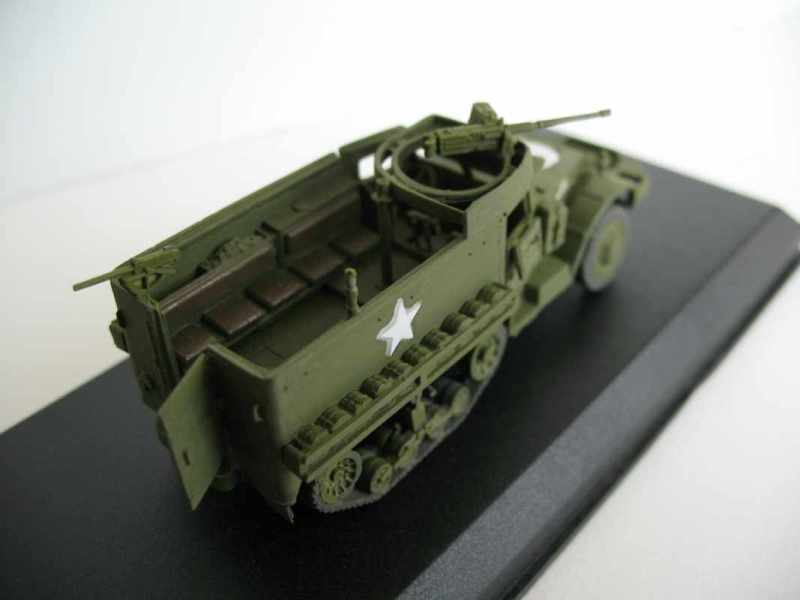 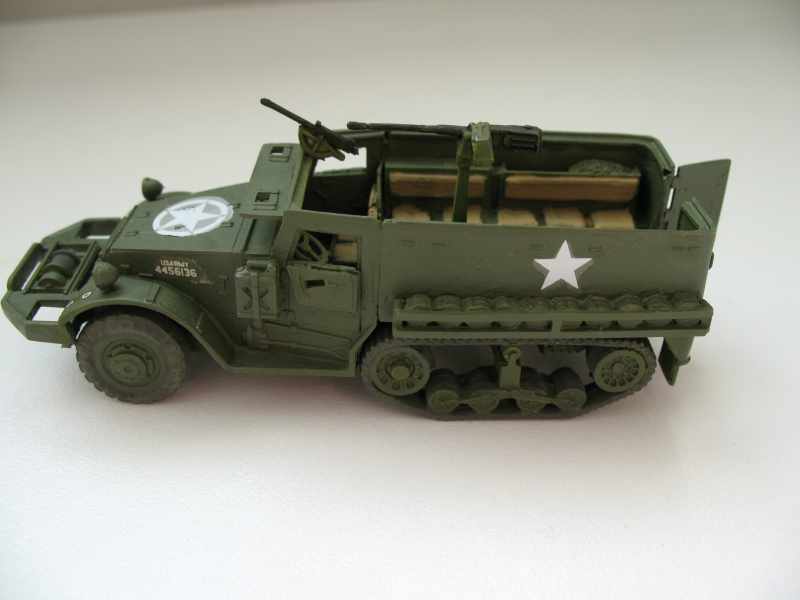 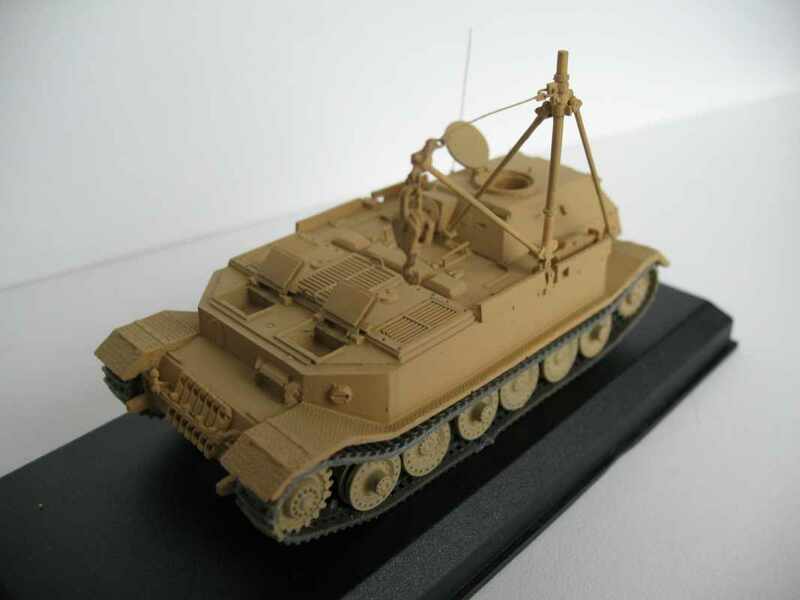 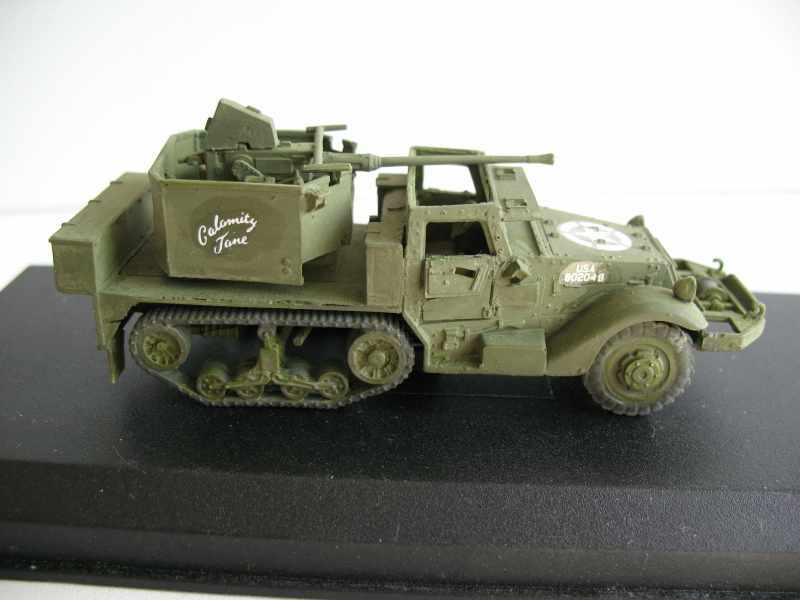 Some resin companies have released a few variants of the US Halftrack in the 1/76 scale. 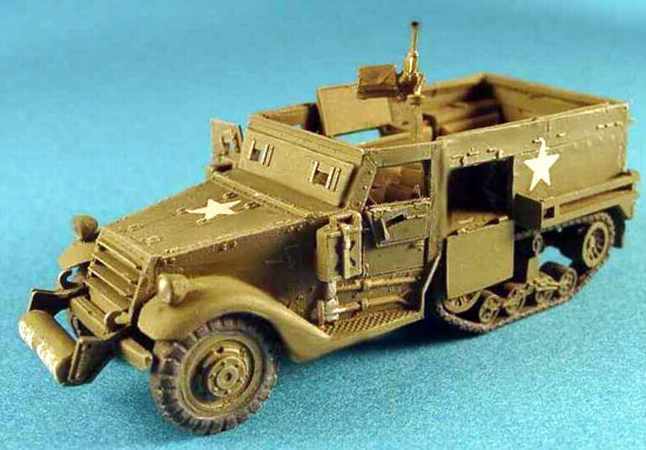 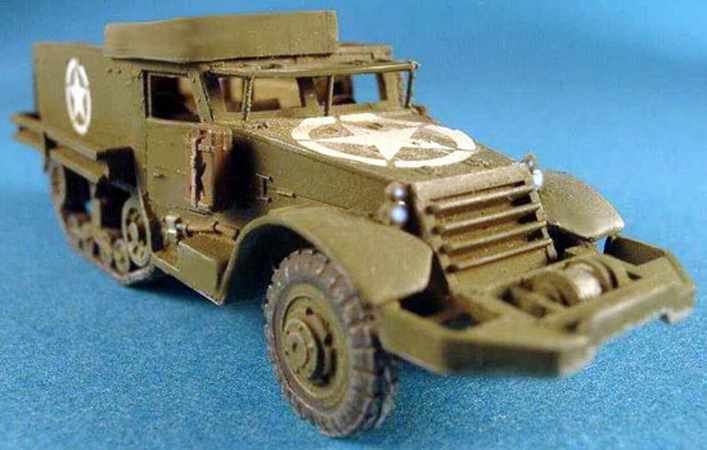 Hopefully there will be soon a company that will doing the U.S Halftrack variants in plastic in the 1/72 scale. 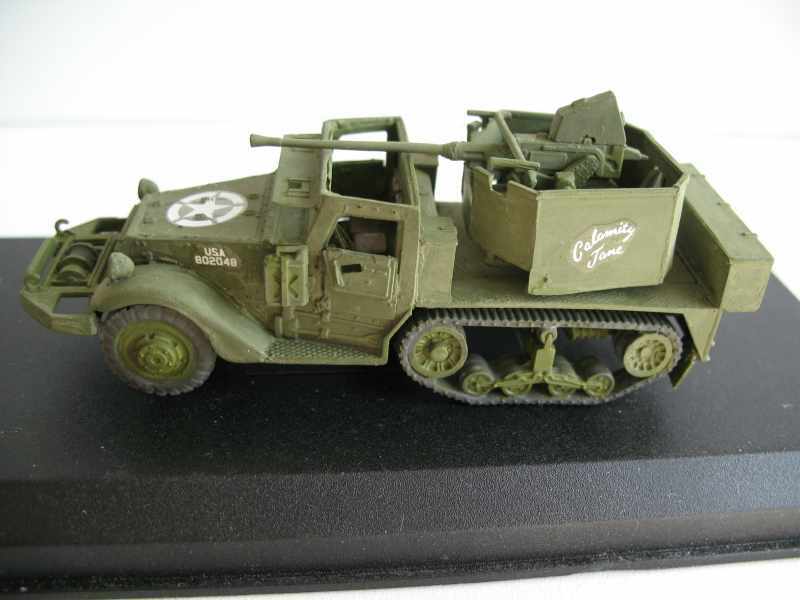 Academy did a good start with his US Halftrack. 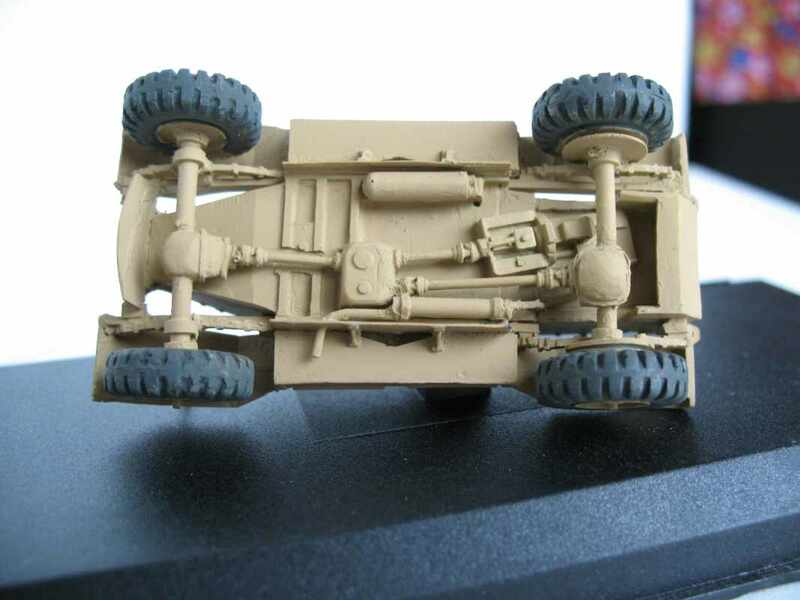 It will be a great line and stopped a gap in the market. 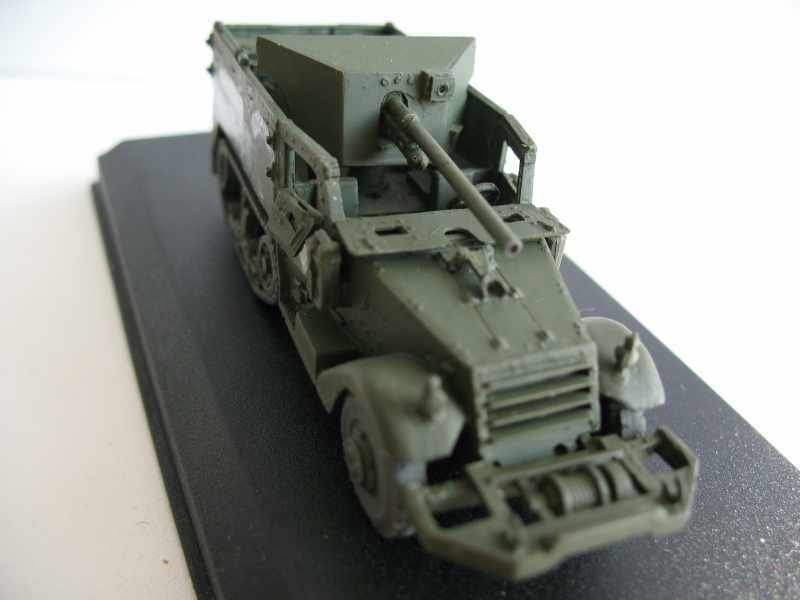 Introduced in 1941 as a Prime Mover for the 105mm Howitzer (US47), their value was soon realised and 11,415 were built and used as MG squad vehicles in armoured recce units. 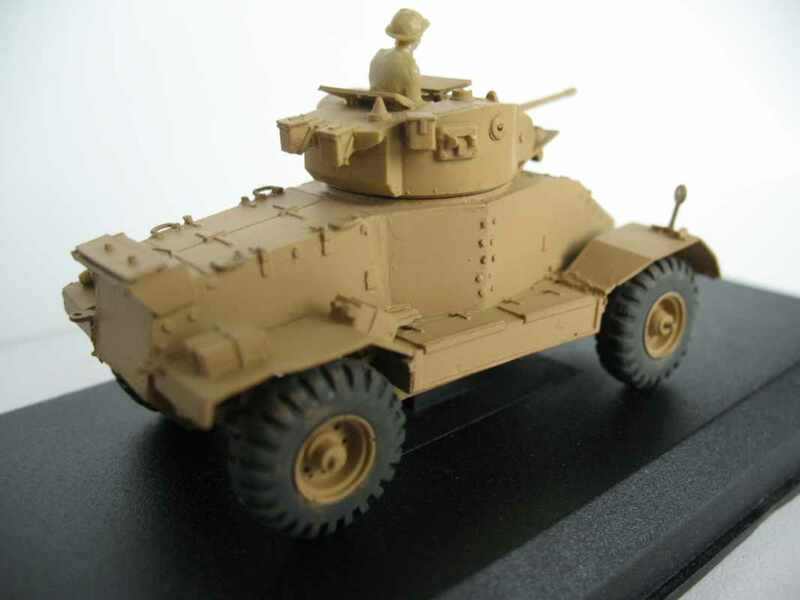 First used in the Philippines, they also saw action in N. Africa, Sicily and Italy. 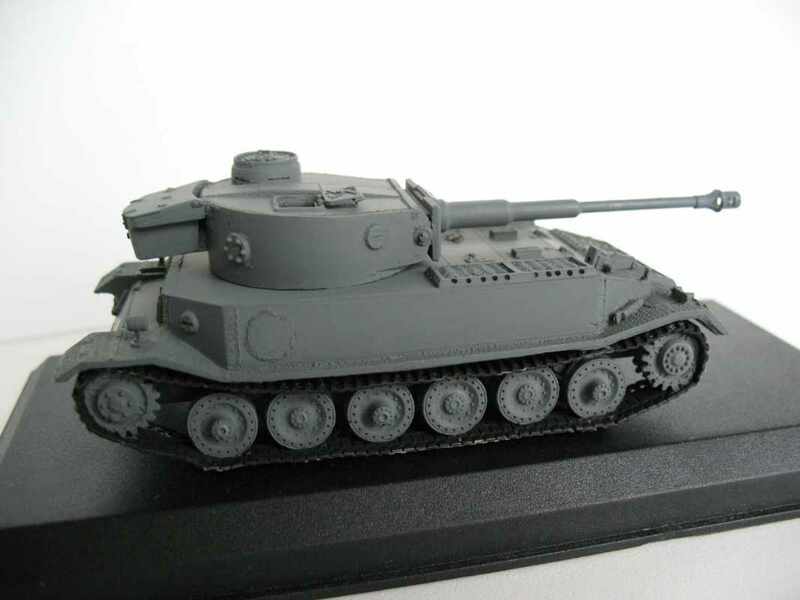 Also supplied to Russia (342), Free French (176) and the Brazilians (8) in Italy. 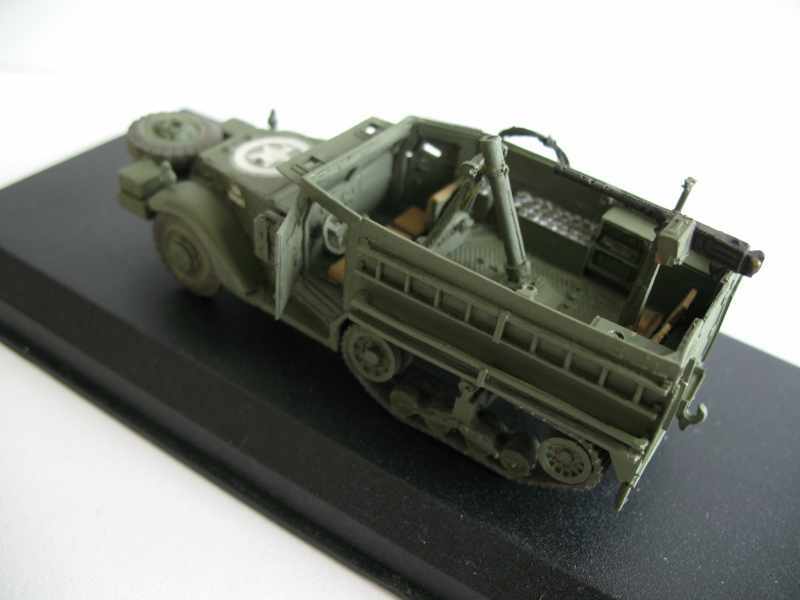 This variant differred from the earlier M2(US29) by the addition of the M49 gun ring. 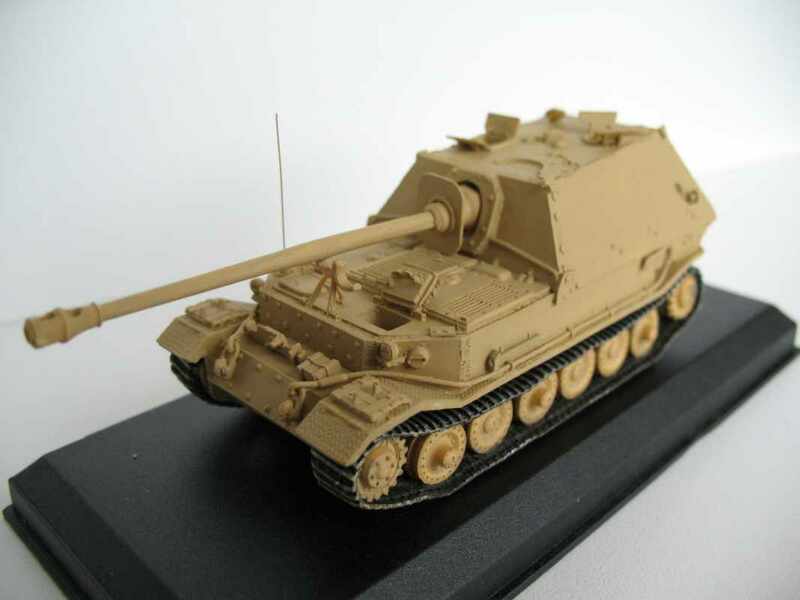 From May 1943, over 5000 M2's were retrofitted with a further 1681 manufactured. 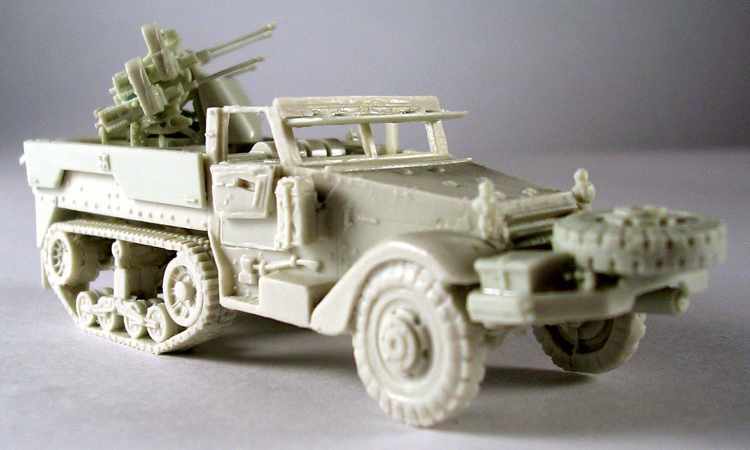 Used in Sicily, Italy, NW Europe and in the Far East. 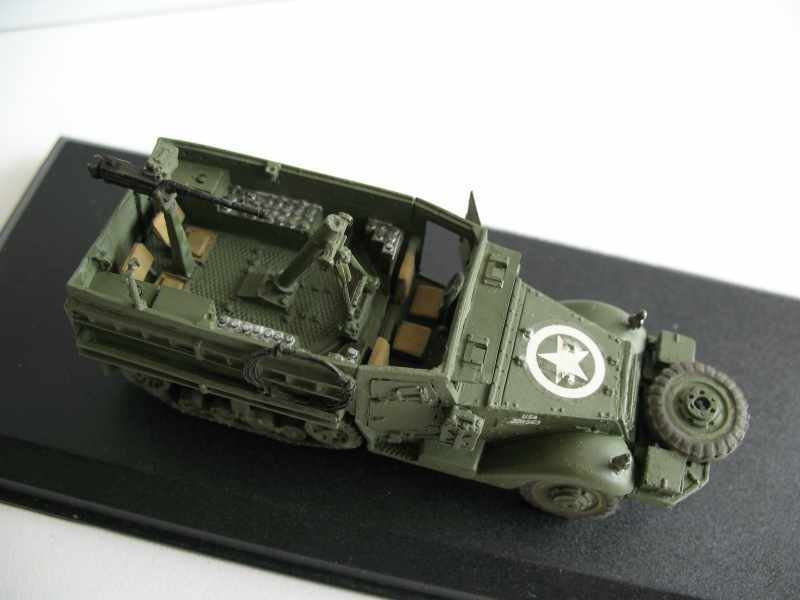 Based on the M2 Halftrack, 572 M4 Halftracks were built between 1940 and 1942. 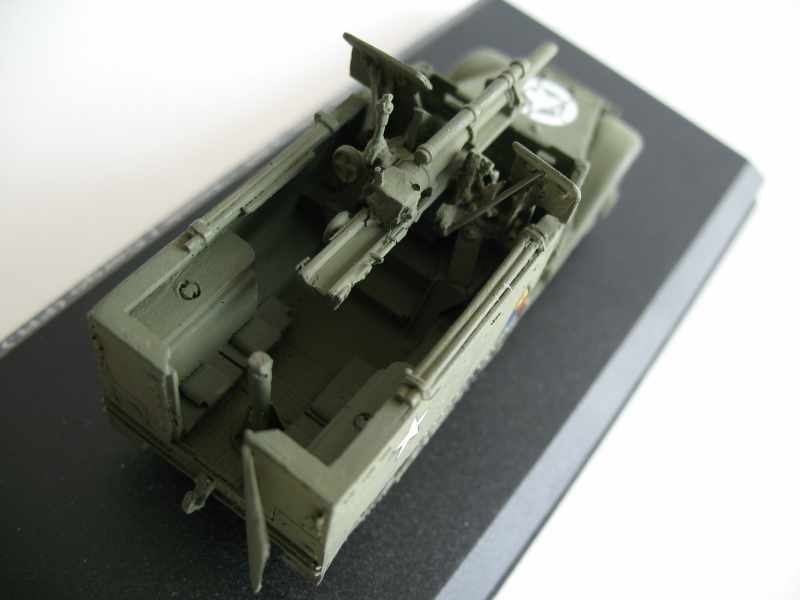 These vehicles also carried the rearwards firing 81mm Mortar which was supposed to be dismounted before firing. 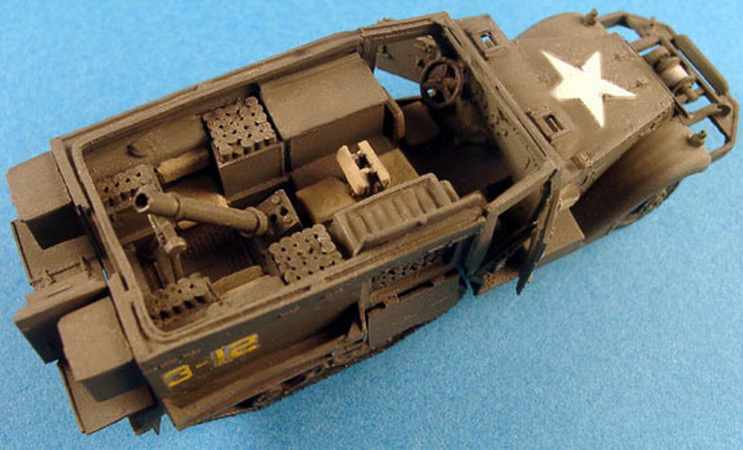 Naturally the troops fired from the safety of halftrack. 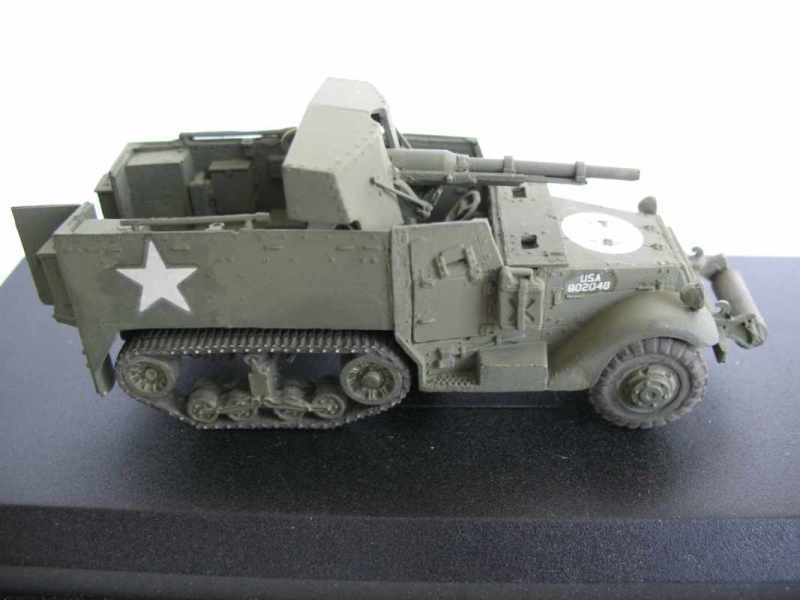 The M5 and M5A1 series were the IHC equivalents of the M3 and M3A1 and differred externally by having flat front fenders and rounded rear edges. 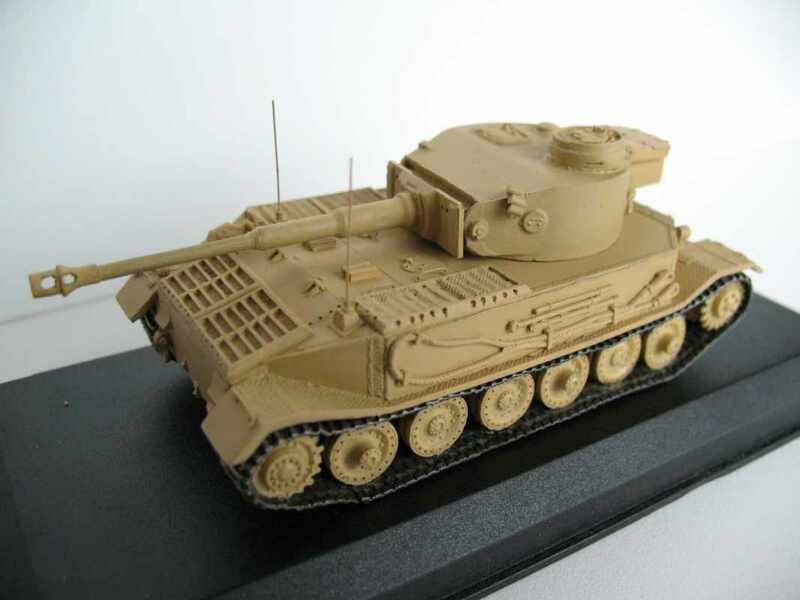 They were built using homogeneous, instead of face hardened armour, ans resultantly were regarded as inferior by the US Army and were allocated for Lend Lease. 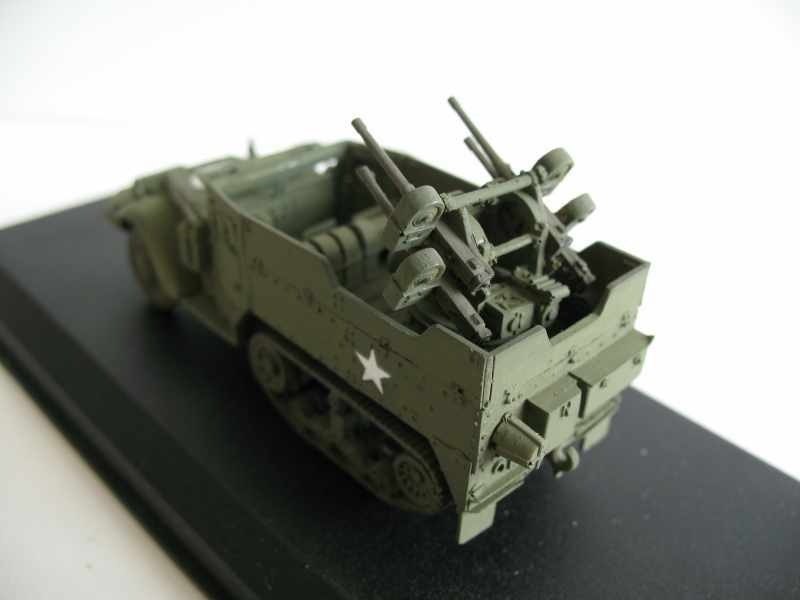 The M9 and M9A1 were the M2 and M2A1 equivalents. 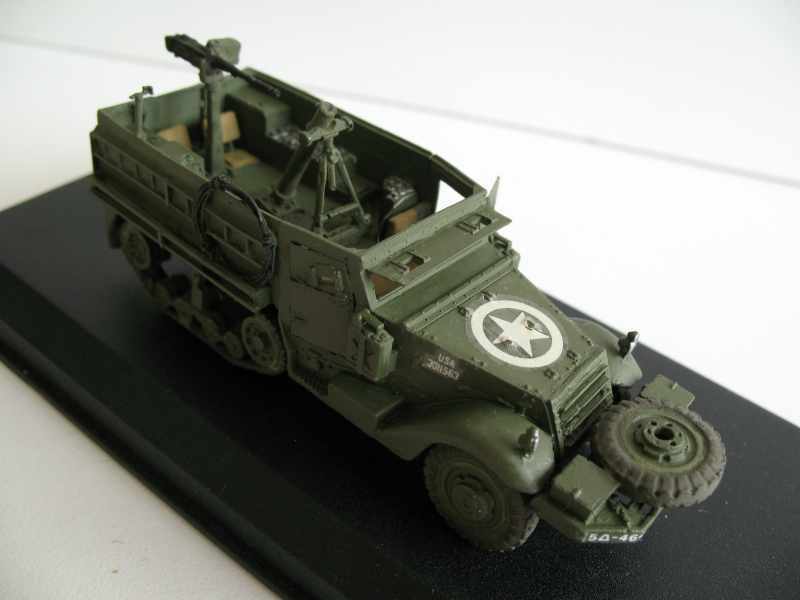 See US29 & US30 also see US32 for historical data. 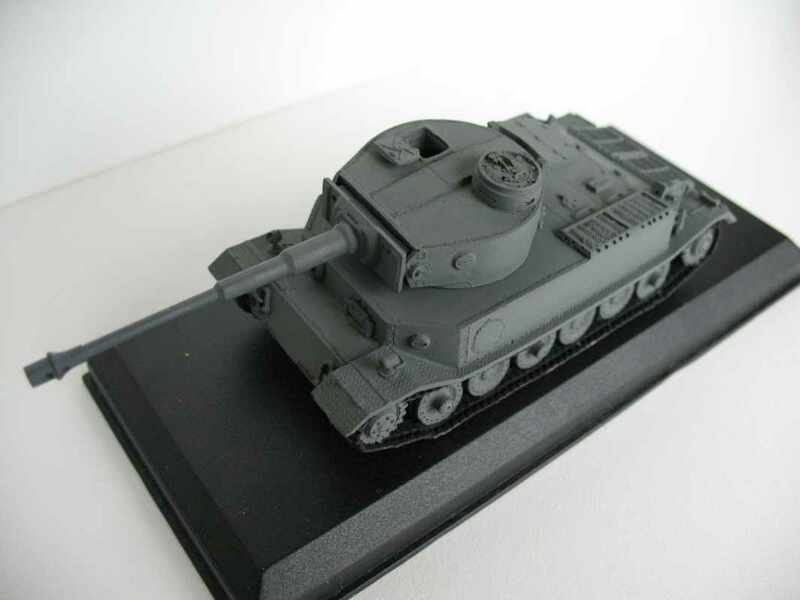 This was the firt signigicant variant of the M3 series. 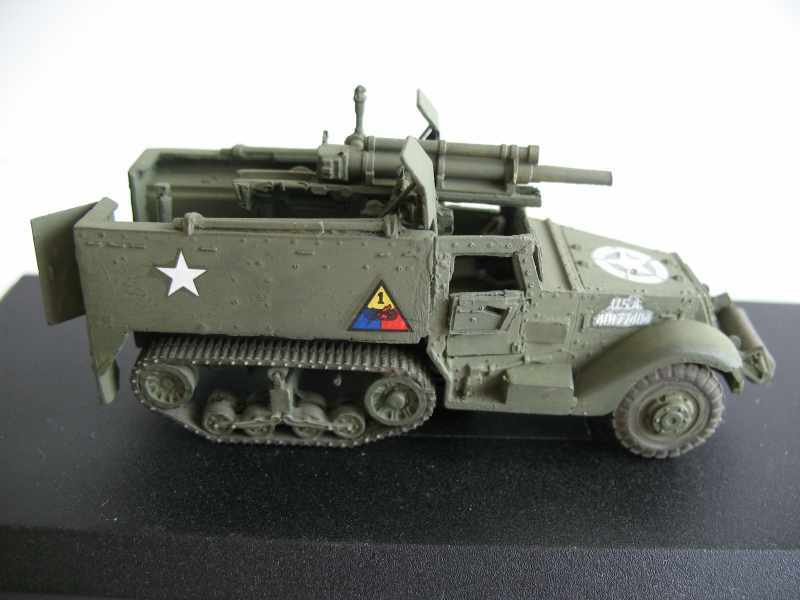 Accepted into service in October 1941, this SPG consisted of the mounting of the M1897A5, a howitzer of WW1 vintage, on the M3. 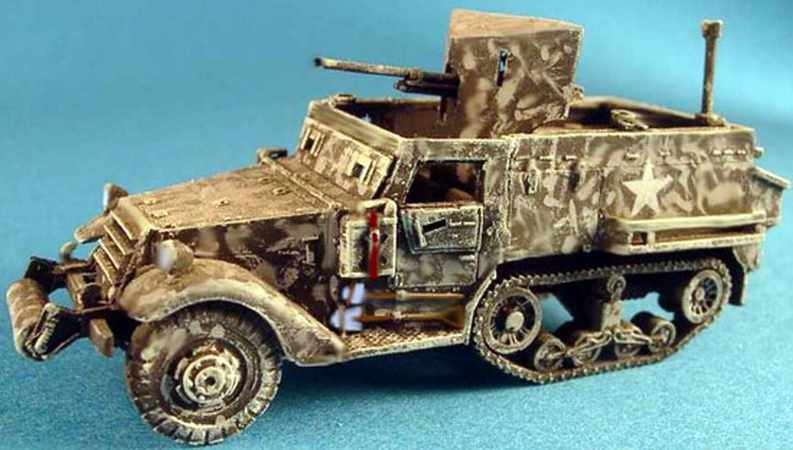 A total of around 1300 were built between early 1941 and April 1943 and first saw action in the Philippines (later used by the Japanese against the US in '44-'45) and later in Tunisia. 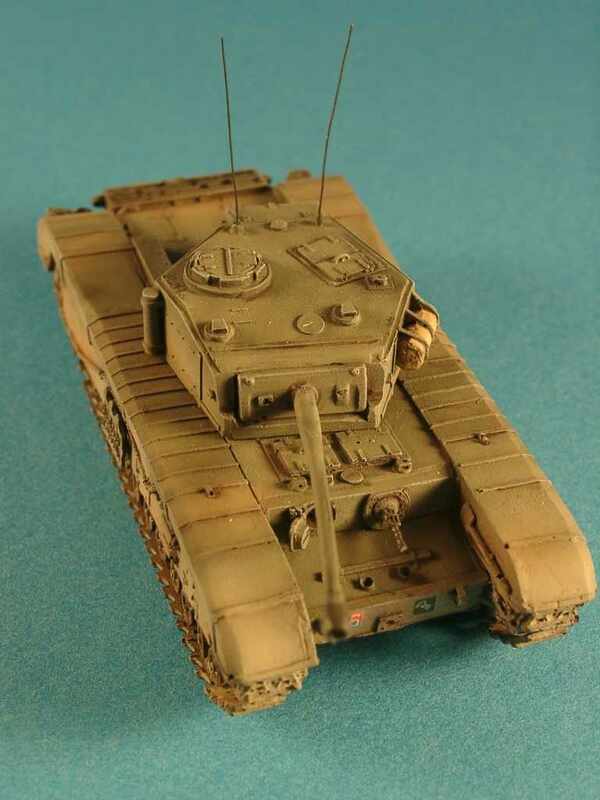 The British received 175 and used them in Tunisia, Sicily, Italy and in the Normandy Campaign! 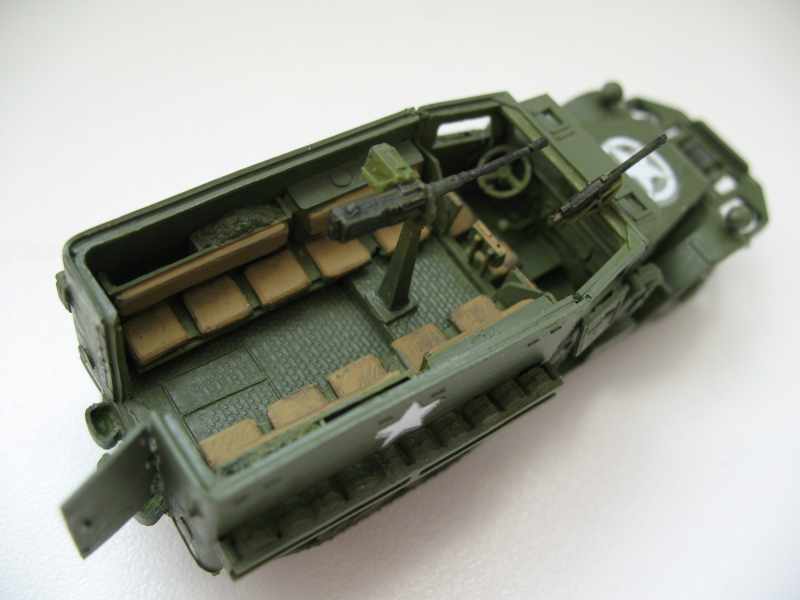 The US Marines used them at Saipan, Peleliu and Okinawa. 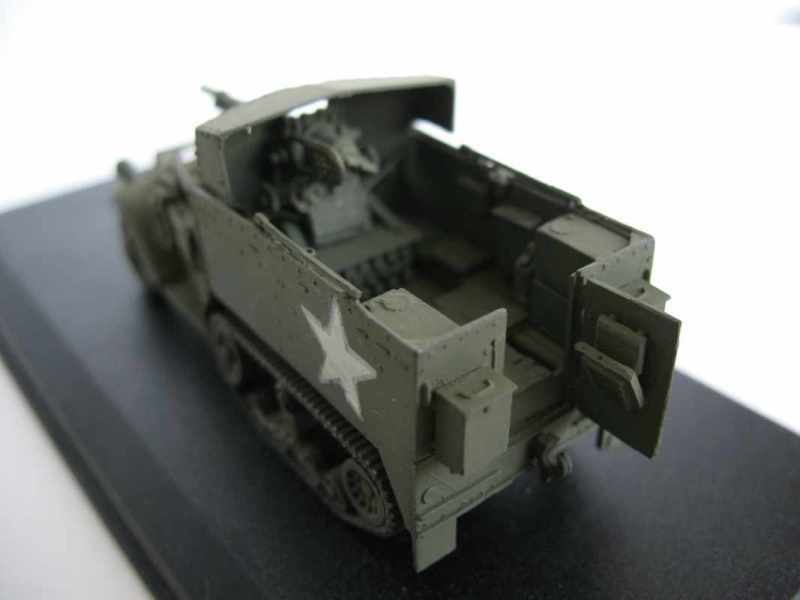 Following experiences with the M4A1 (US31), it was decided that a forward firing 81mm mortar halftrack was required. 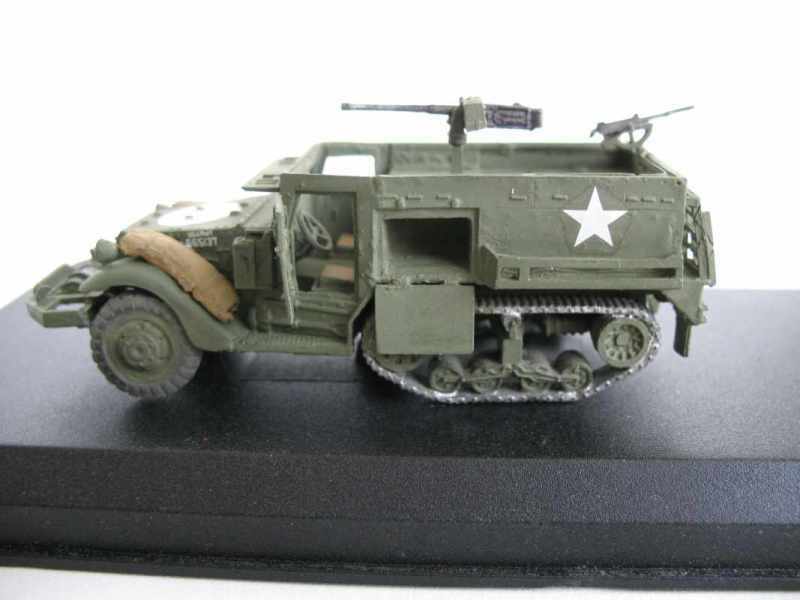 Using the longer M3 Halftrack, 110 were built in early 1944 and saw service in Italy and NW Europe. 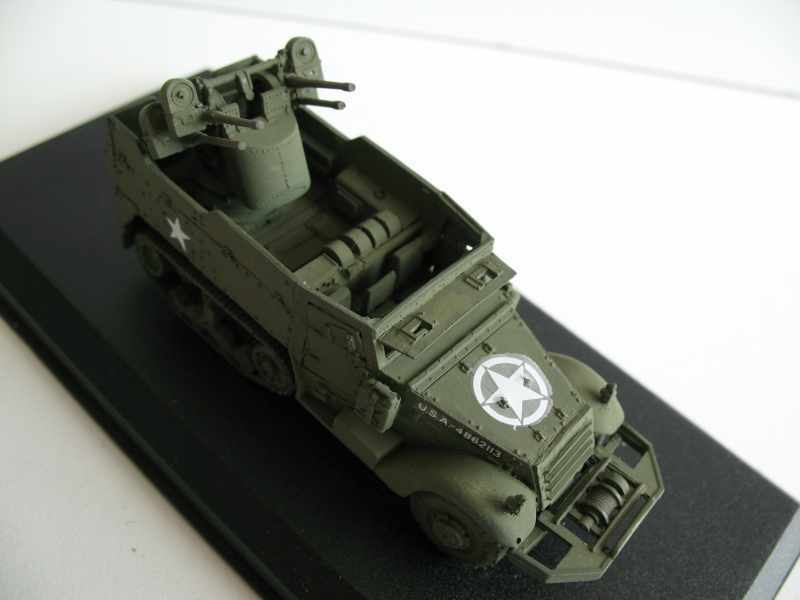 The M6 GMC, a Dodge weapons carrier armed with the 37mm M6 anti-tank gun, proved quite inadequate when used in combat in N.Africa. 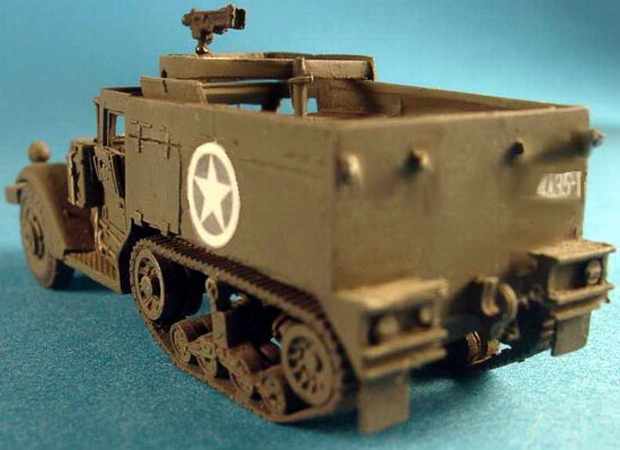 Resultantly some M6's were stripped and added to M2 Halftracks. 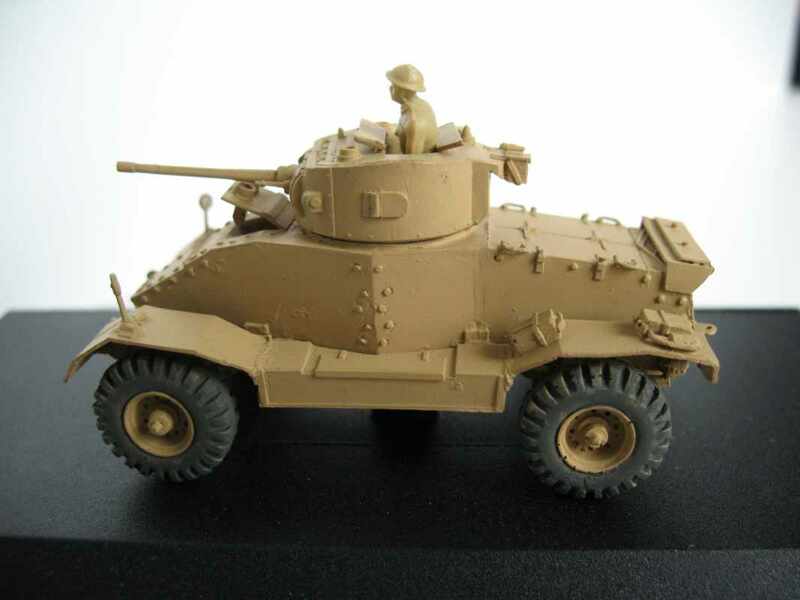 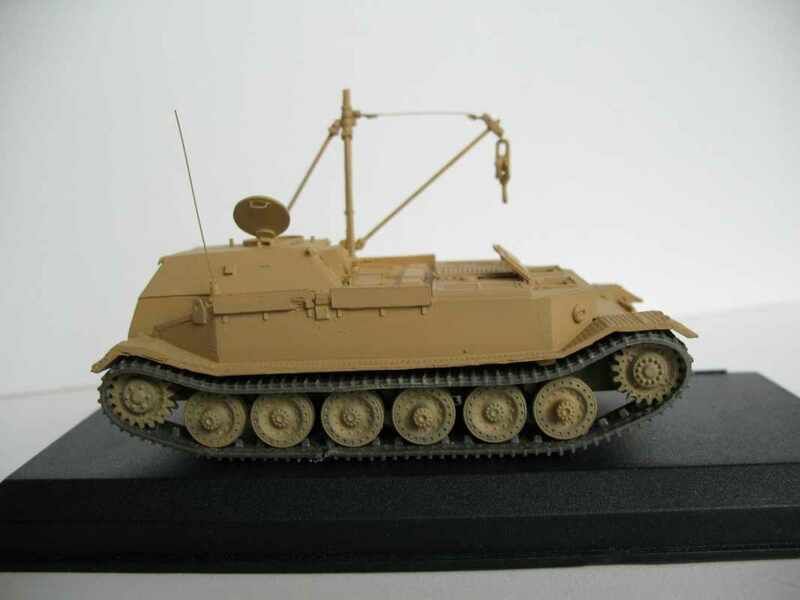 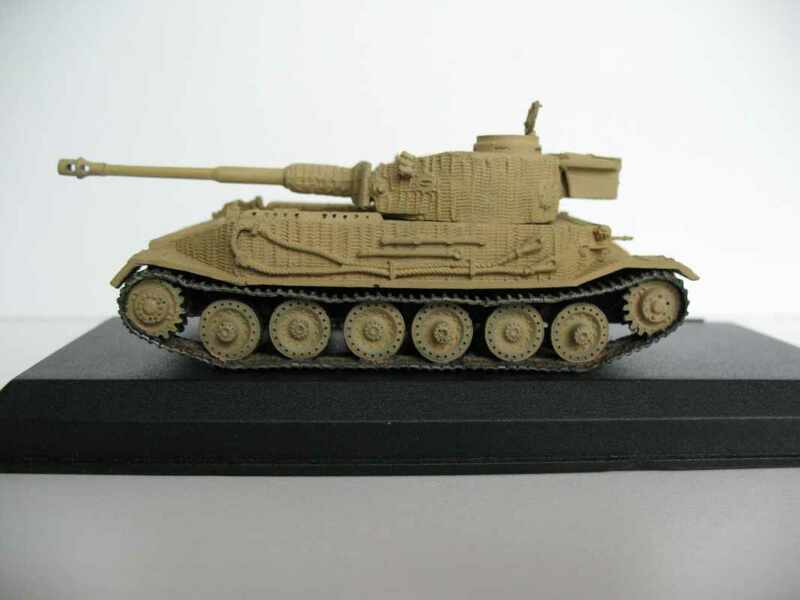 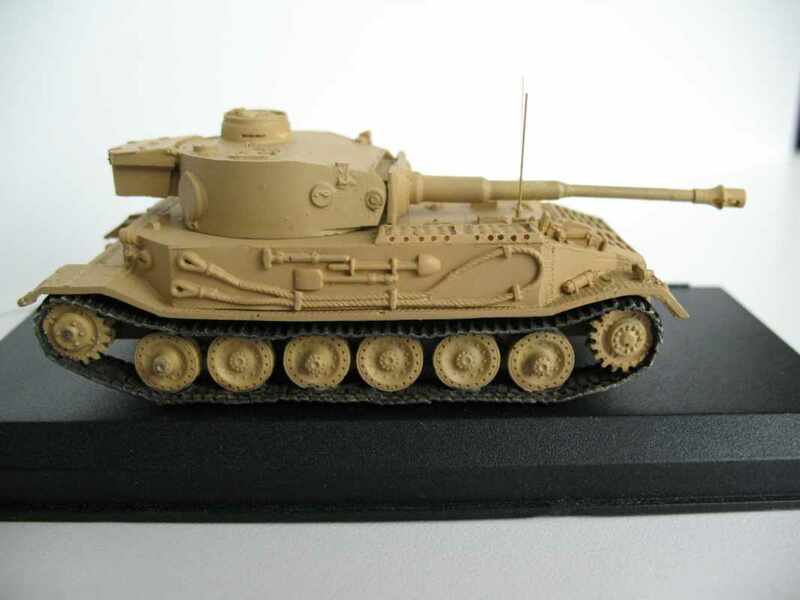 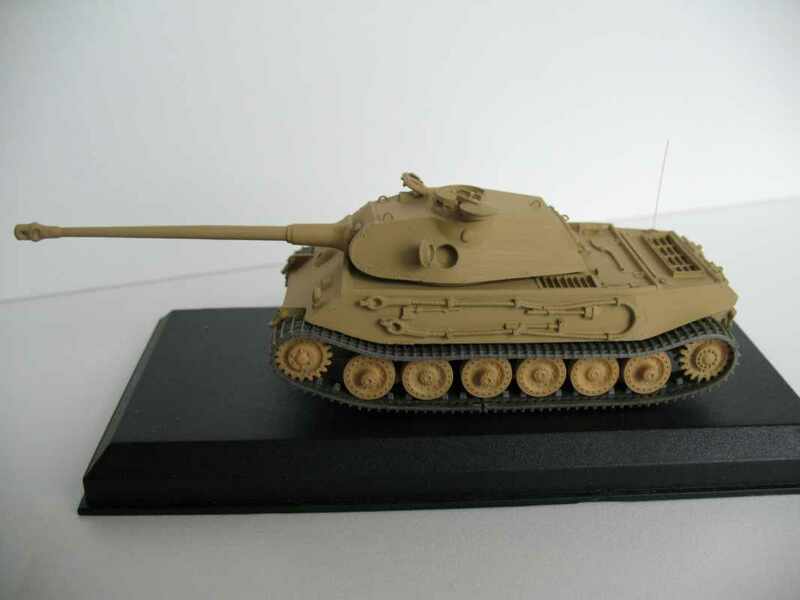 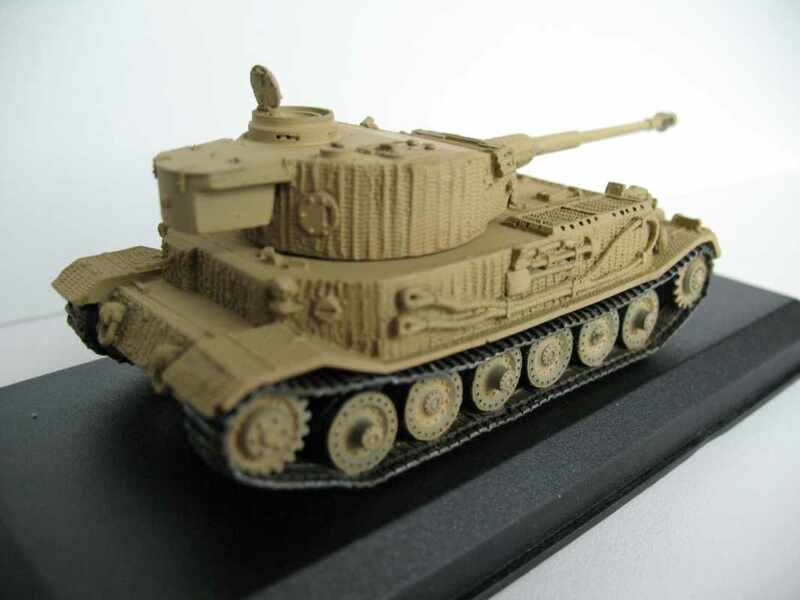 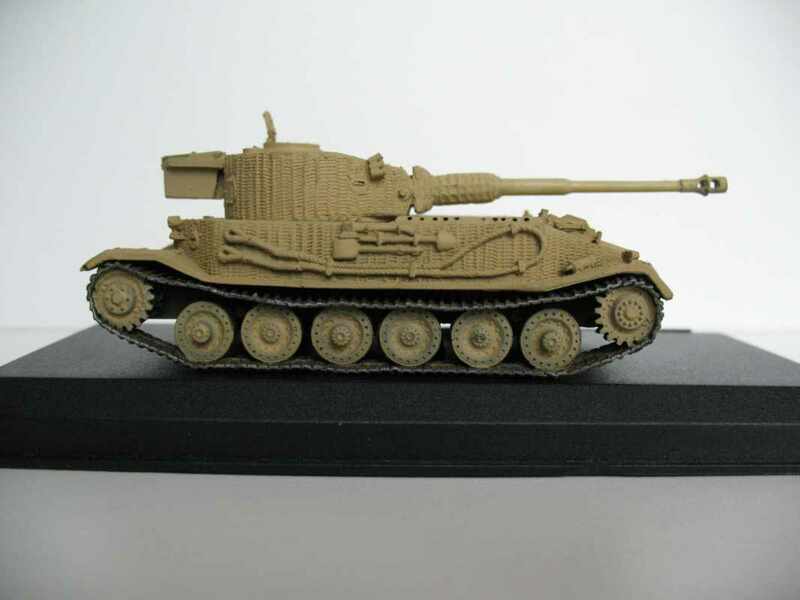 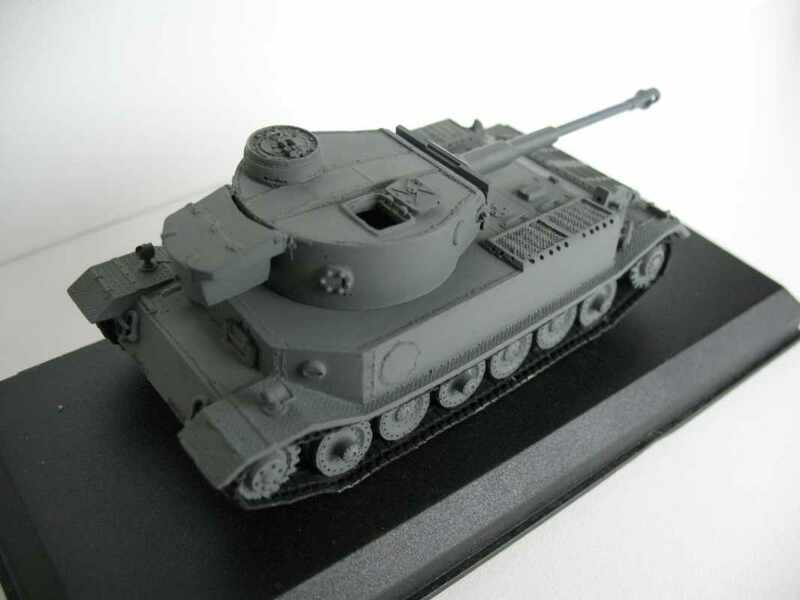 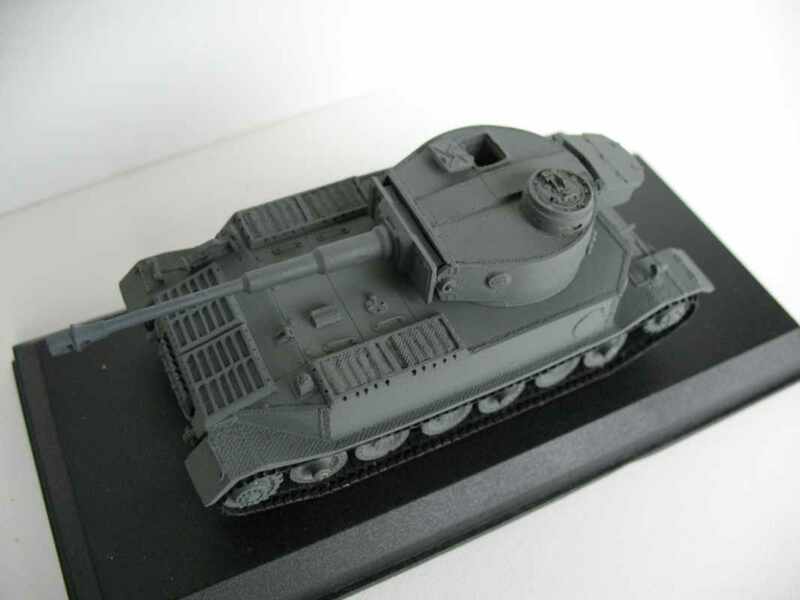 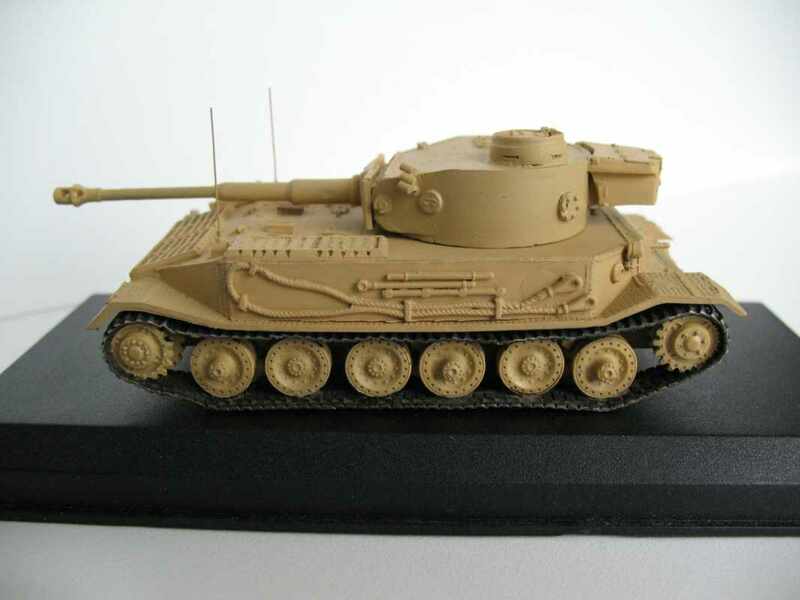 Our model depicts this conversion as used in Tunisia, Sicily and possibly Normandy. 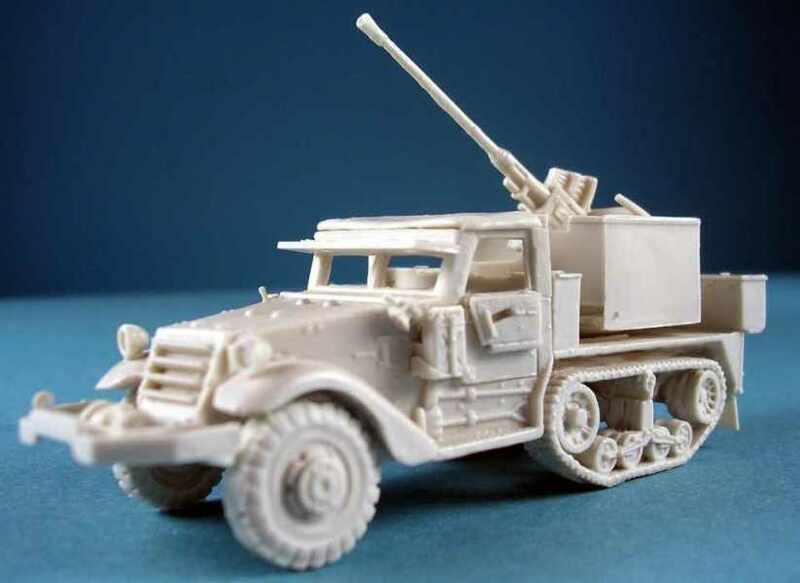 This SPG combined the M3 Halftrack (US27) with the reliable M2A1 105mm Howitzer (US47). 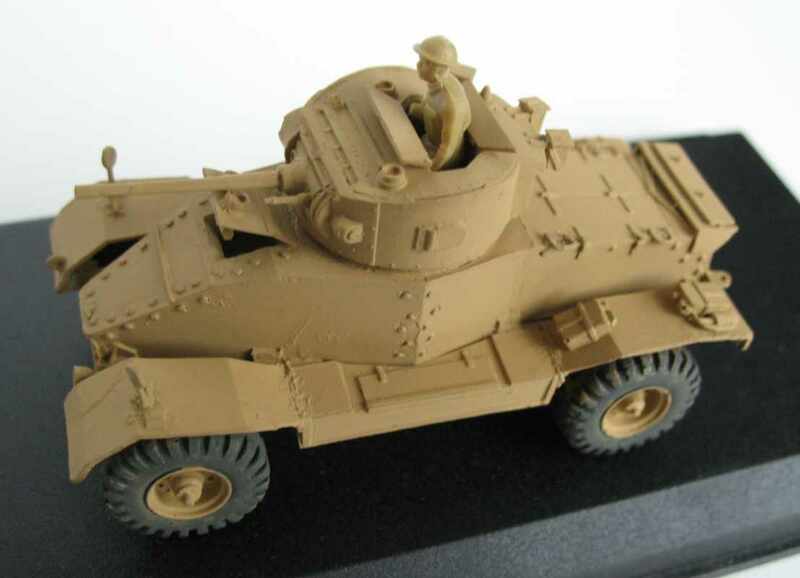 A total of 324 were built from April 1942 and thses saw action in Algeria, Tunisia, Sicily, with some still in use as late as 1944 in Italy. 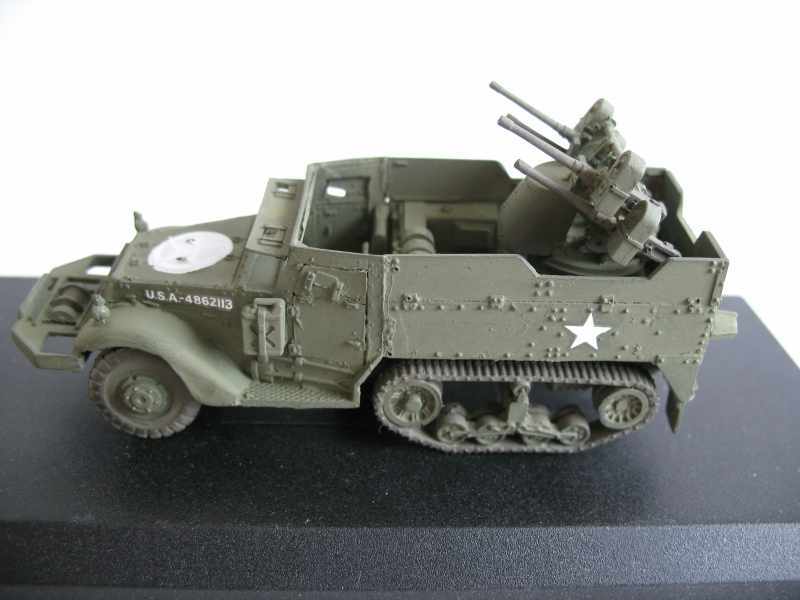 Official attempts to mount the 40mm Bofors gun on the M3 Halftrack had been abandoned in July 1943 as impractical. 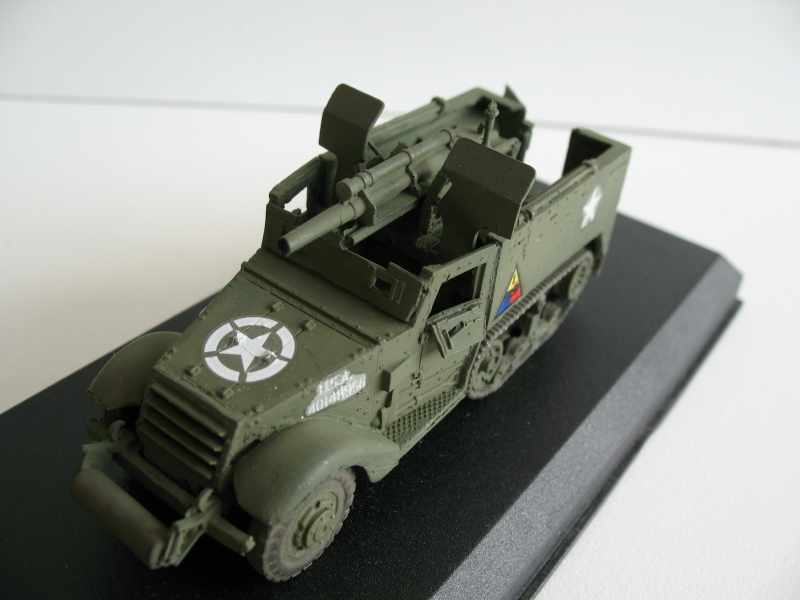 However the US 99th Ordnance Depot in Australia did succeed and produced a number of these effective SPG's. 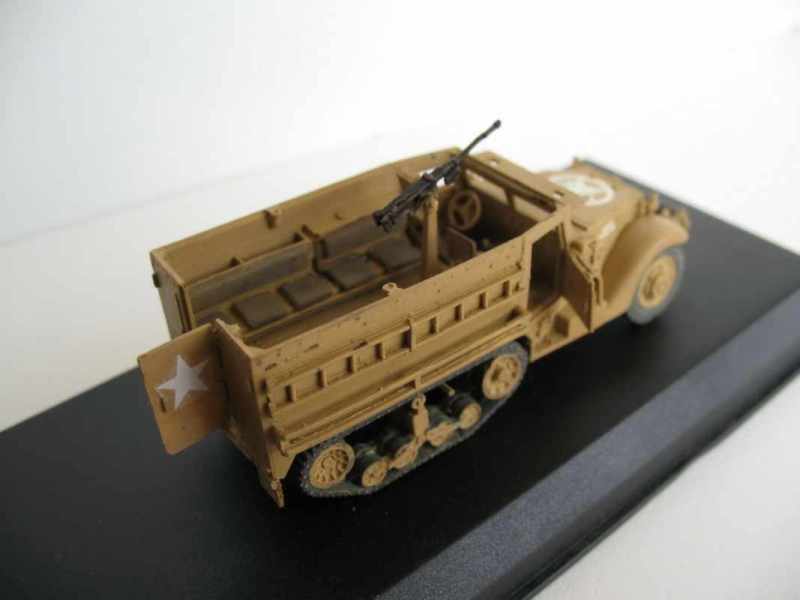 They first saw action at Luzon and continued in service seeing action in Korea. 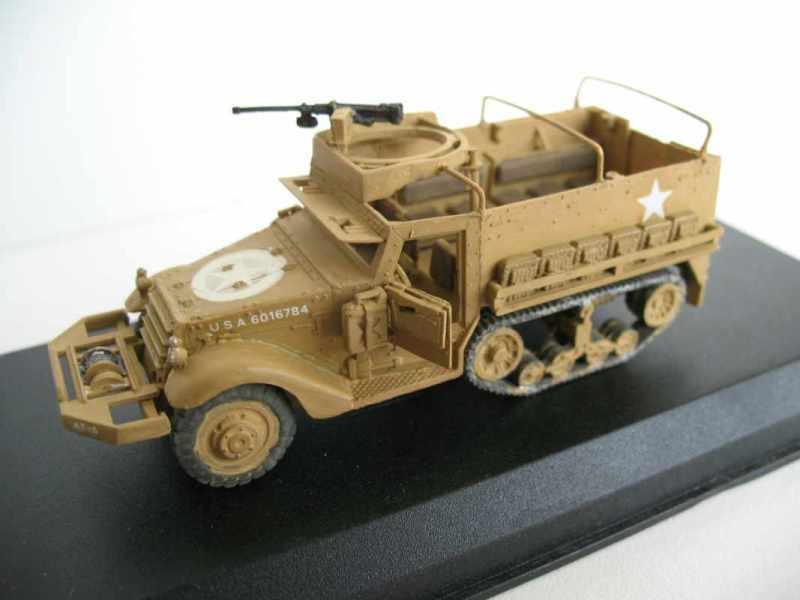 Designated as T48, this American built Halftrack mounted the M1 57mm gun (the American copy of the British 6pdr.) 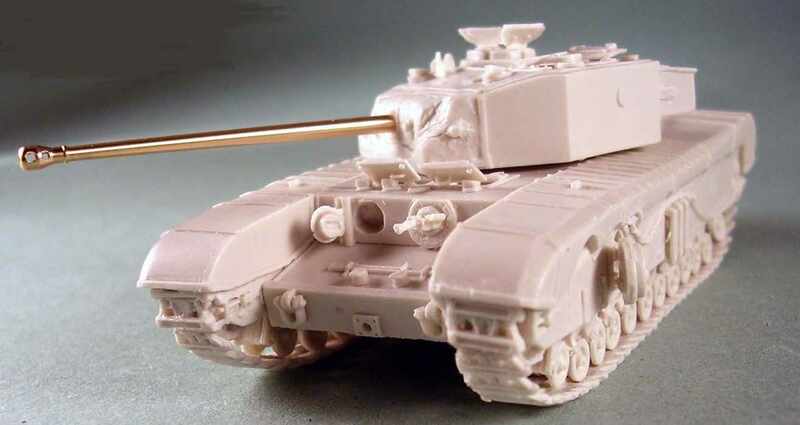 and was originally intended for British use. 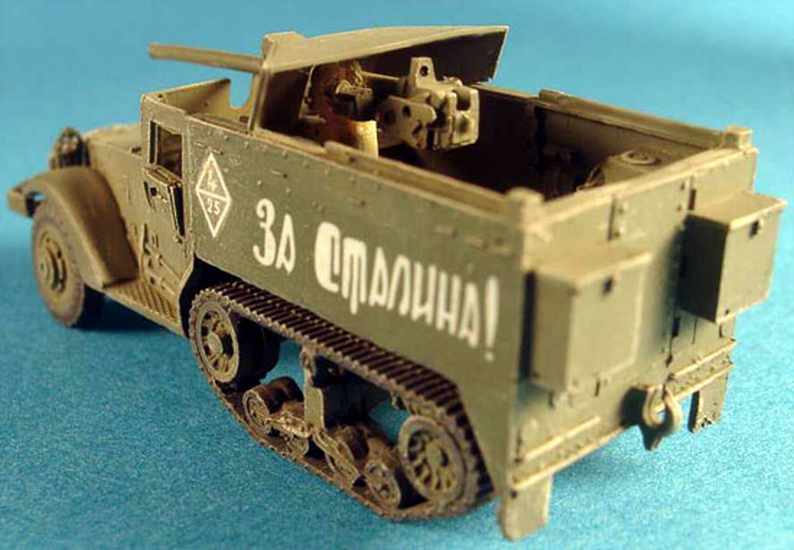 Approximately 350 were supplied to the Russians who in turn also allocated 156 to the Polish Peoples Army.First seeing action in 1943 at Dnepr River in the Ukraine, they continued in service until wars end. 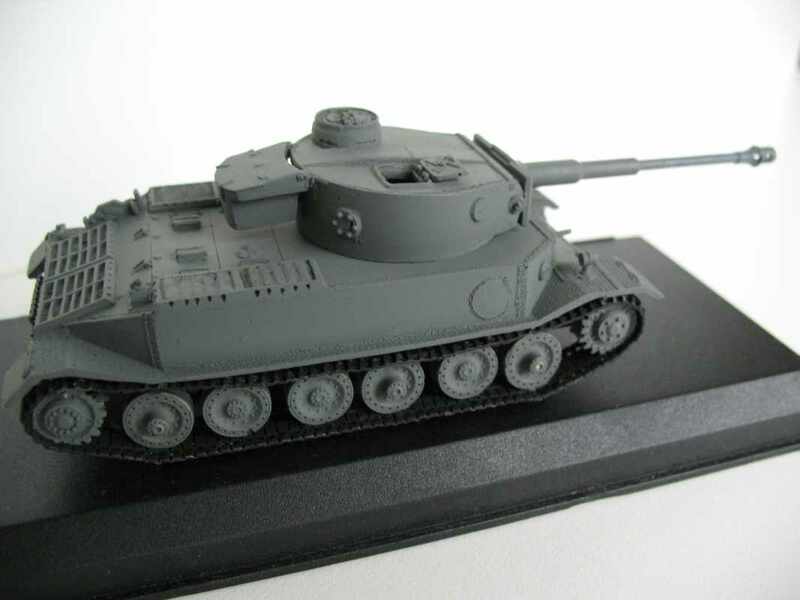 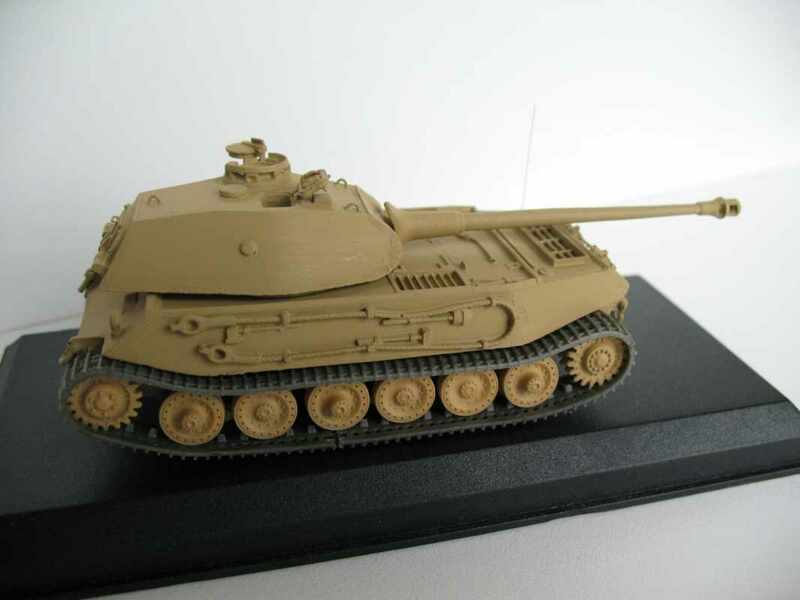 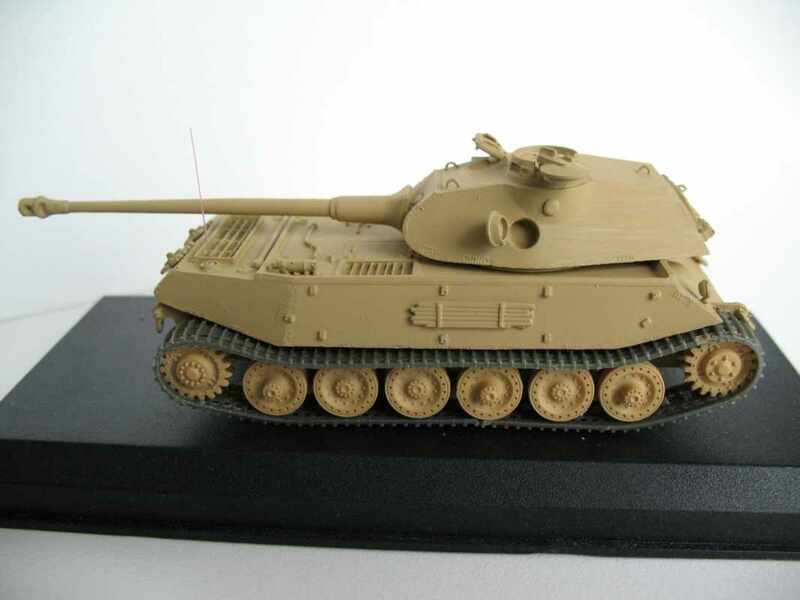 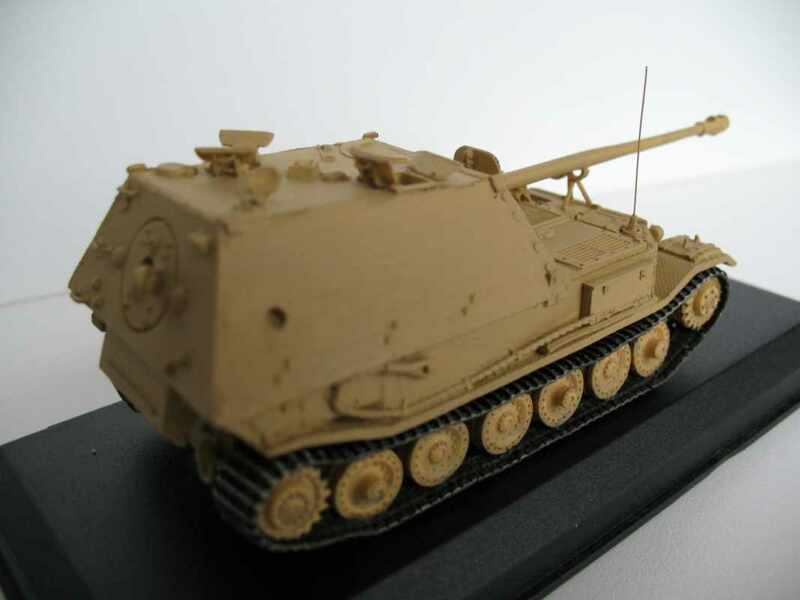 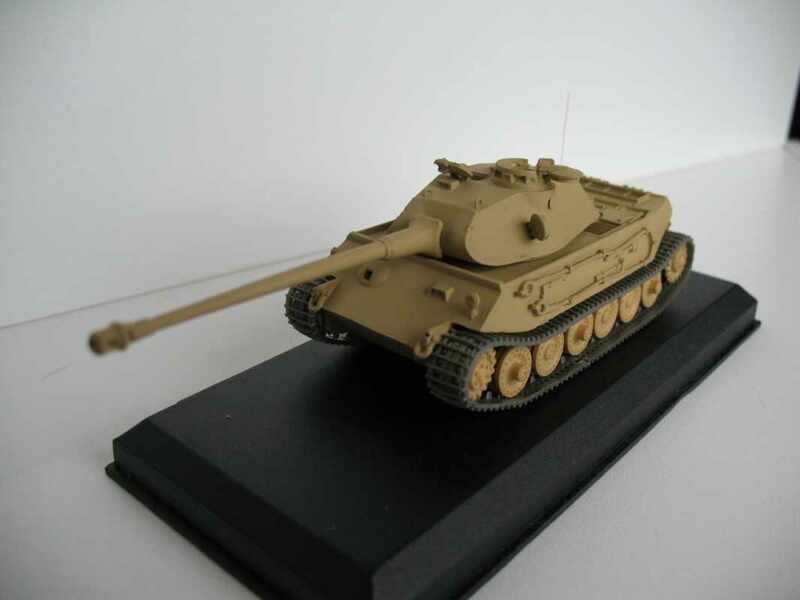 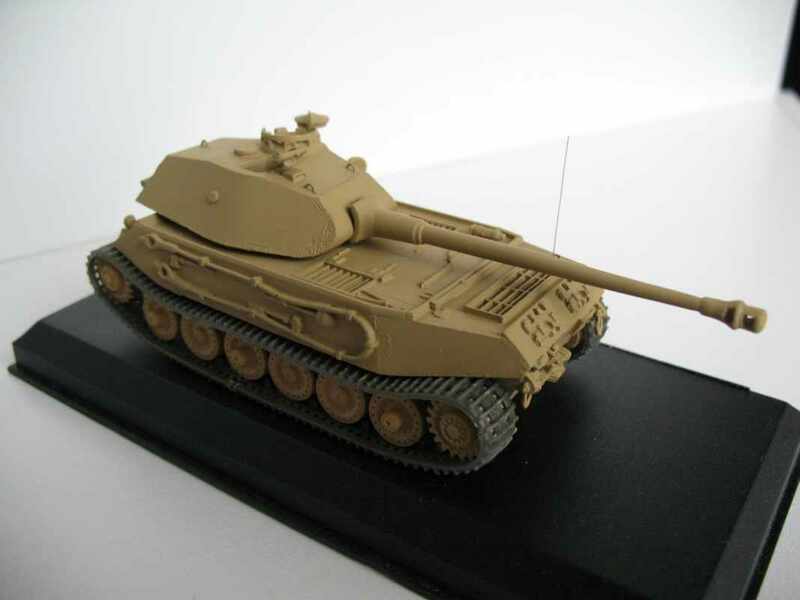 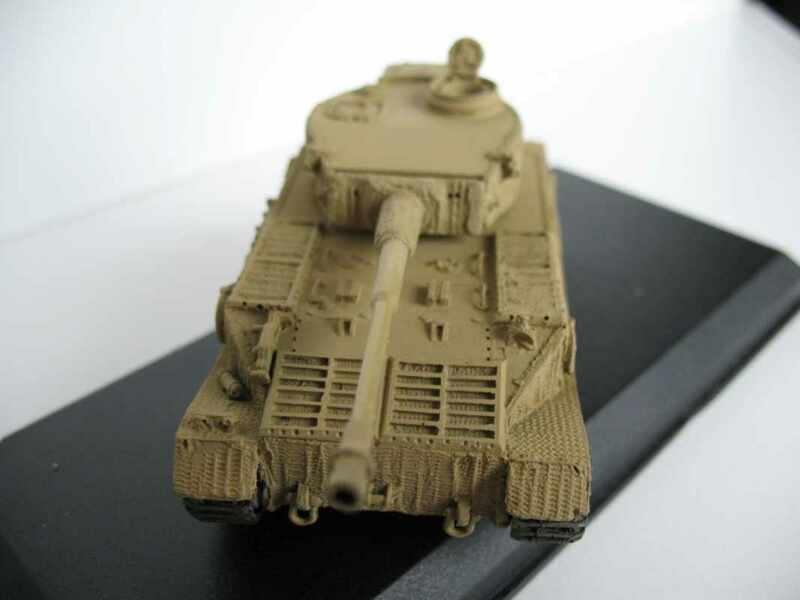 The model depicts the prototype Porsche Tiger with its distinctive turret configuration. 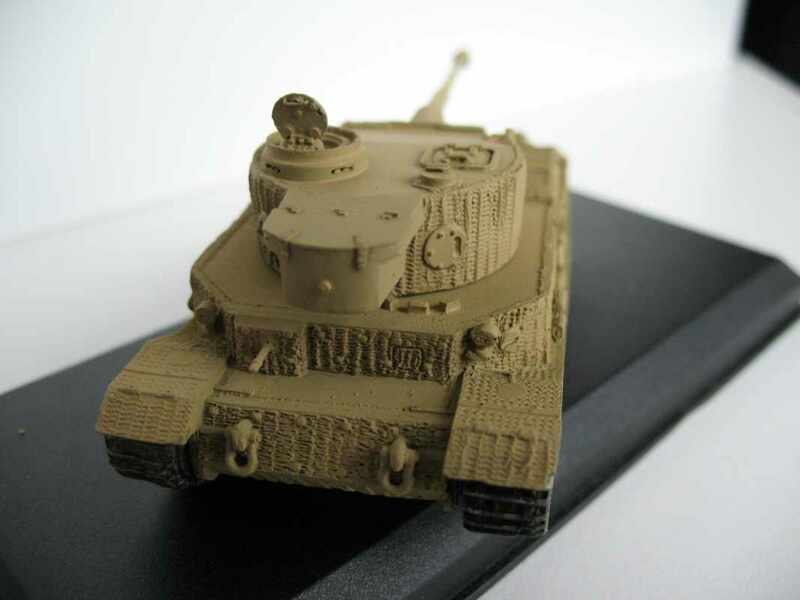 Ferdinand Porsche, an acolyte of Hitler, was confident his design for the new heavy tank to be known as the Tiger would be accepted, and had both the chassis and track systems built in anticipation. 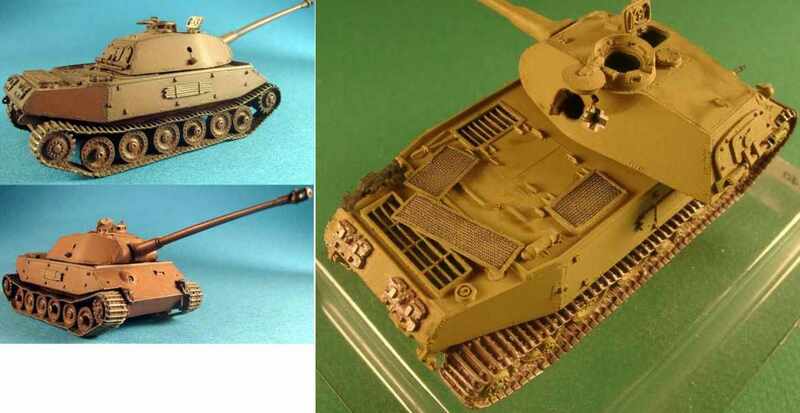 Henschel's design was however accepted but some of these, with modifications, were used operationally. 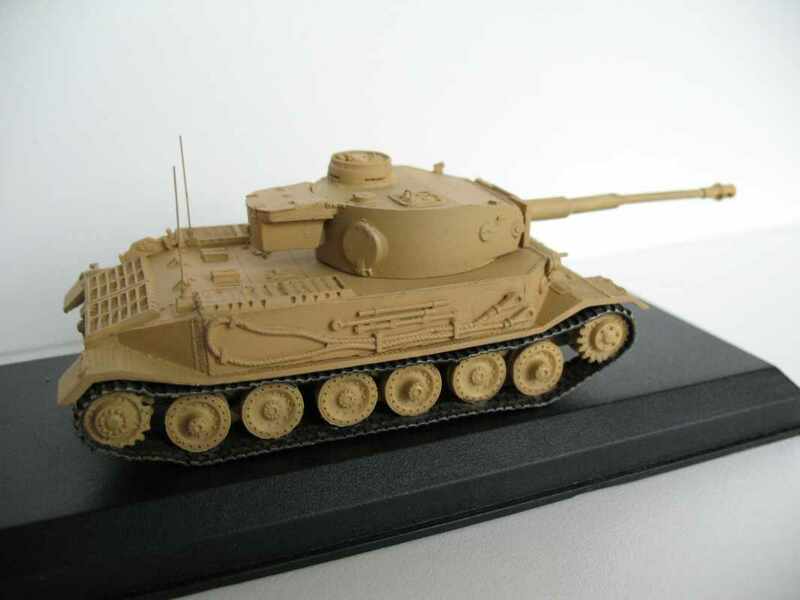 Note: The remaining hulls were used to produce the Ferdinand, Elephant, Bergertiger(P) and in the final form as the VK4502(P) Tiger II. 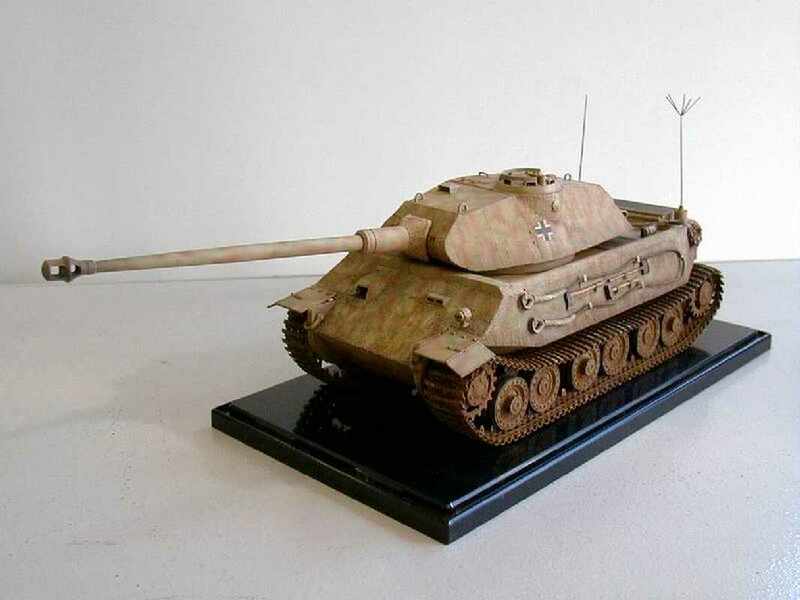 Following the rejection of his prototype design in favour of the Henschel Tiger, Ferdinand Porsche was left with a number of hulls and suspension systems which had been built in anticipation. 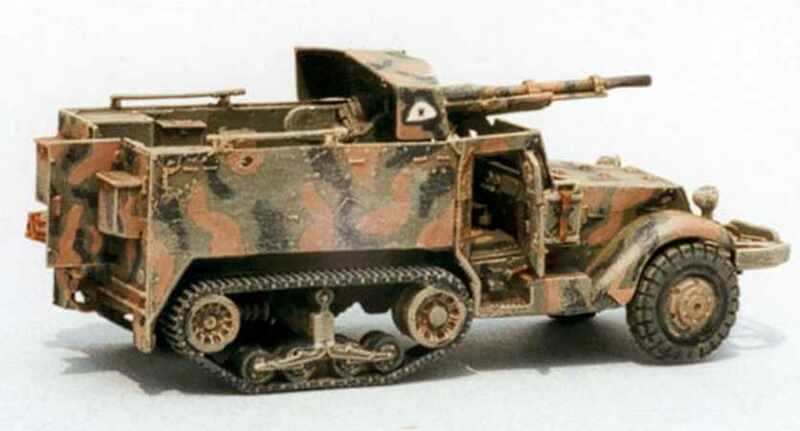 However in keeping with Hitlers practice, the Porsche designs that had been built were also accepted, and with modifications these vehicles were then put into service on the Eastern Front. 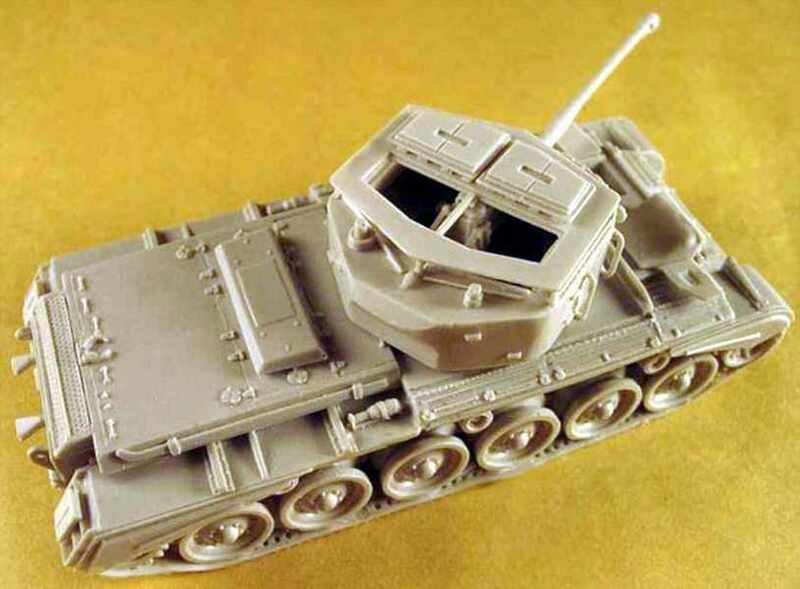 This vehicle is another legacy of Porsche's failed attempts to win the Tiger contracts. 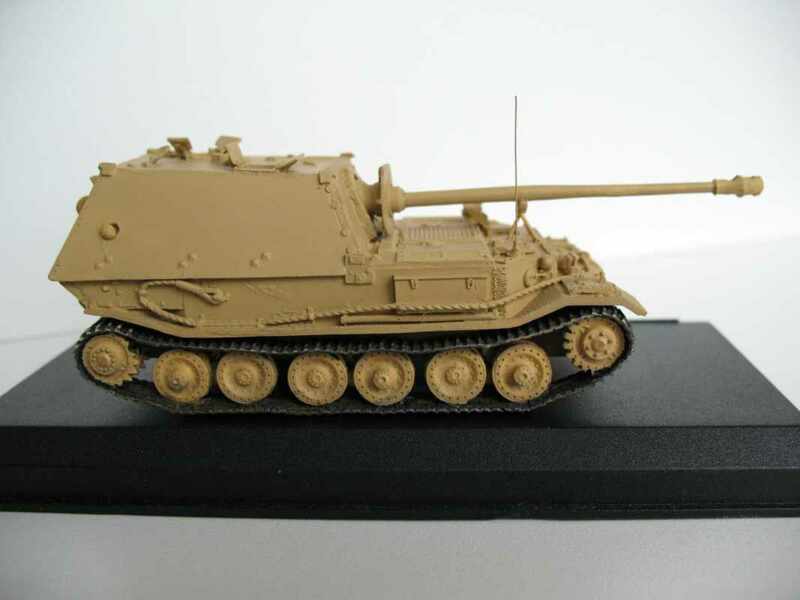 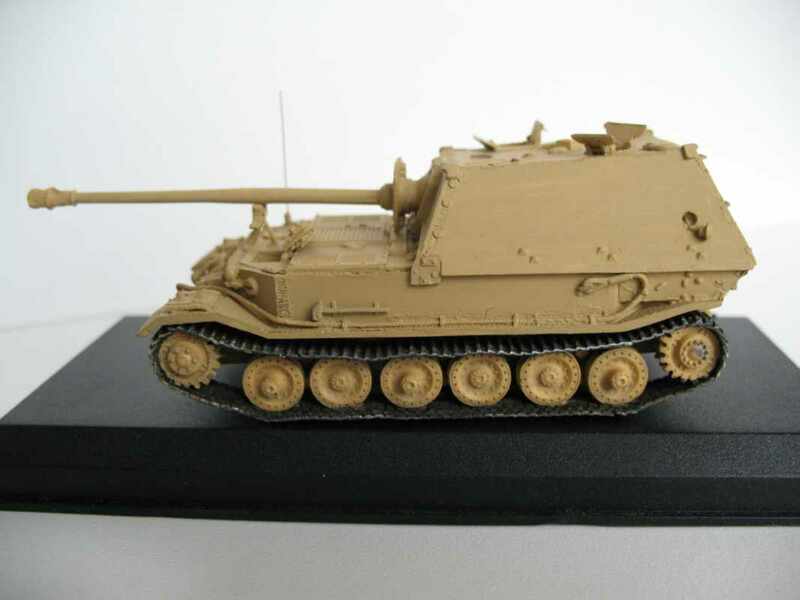 Using the early style suspension from the VK4501(P) and with a more balistic design, this was put forward for the Tiger II contract. 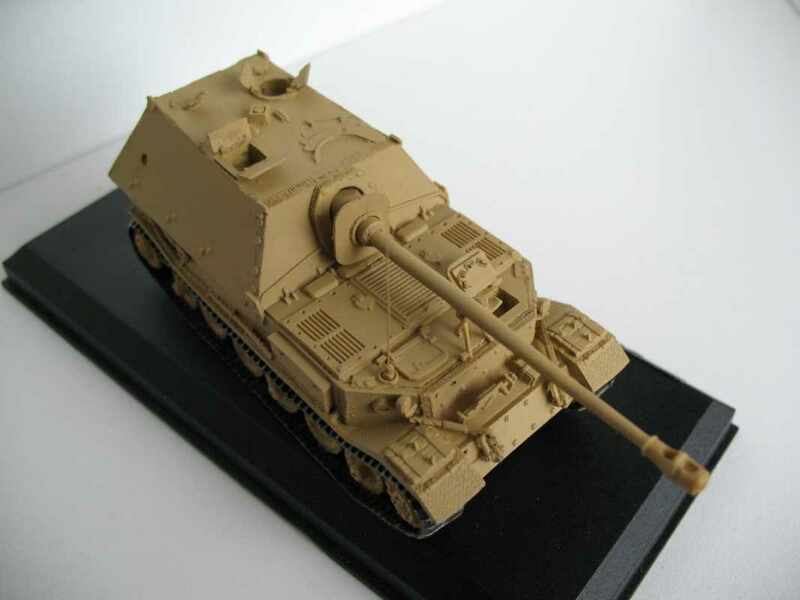 Again believing that the contract bid would successful, fifty turrets were supplied by Krupp. 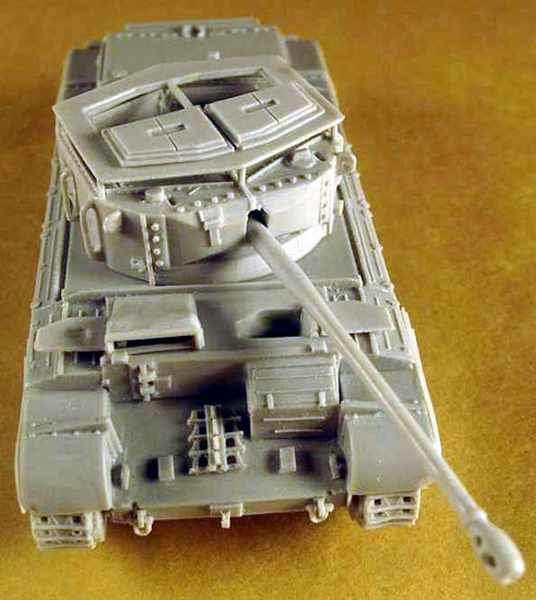 These were subsequently used on the "Porsche" Tiger II but were critised for their "shot trap" at the turret ring, but as is evident on this hull, for which it was specifically designed, the problem did not occur. 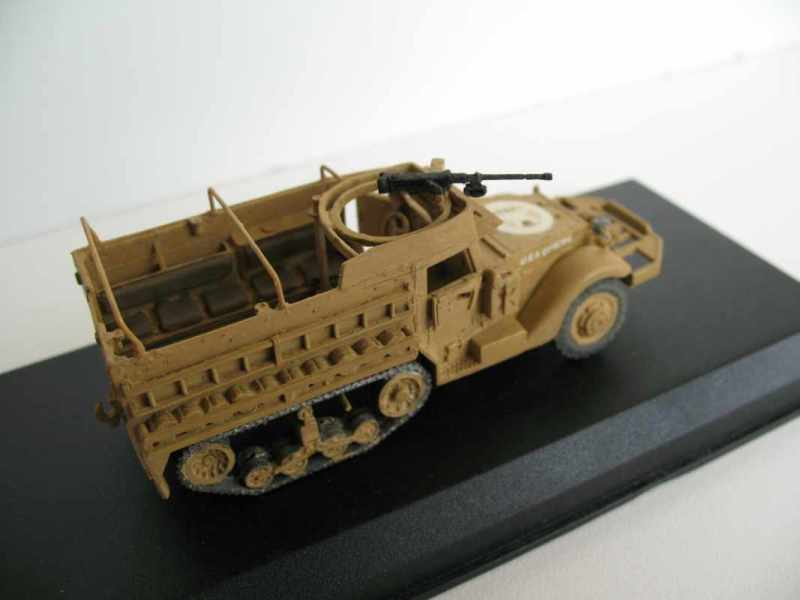 Only one complete vehicle was built and according to authoritive sources this vehicle saw action, albeit briefly, at Kummersdorf in 1945. 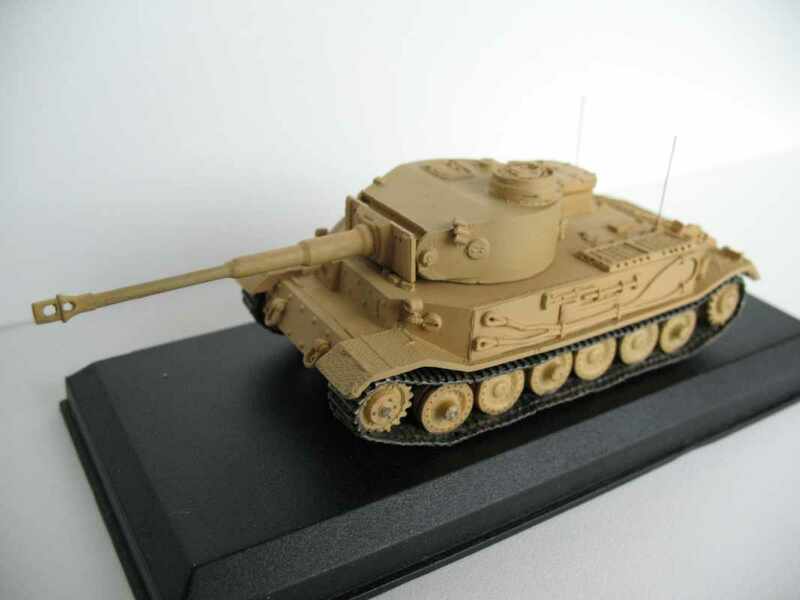 Following the rejection of the Porsche design in favour of the Henschel Tiger, the remaining hulls were mostly converted to produce the Ferdinand and then the Elephant. 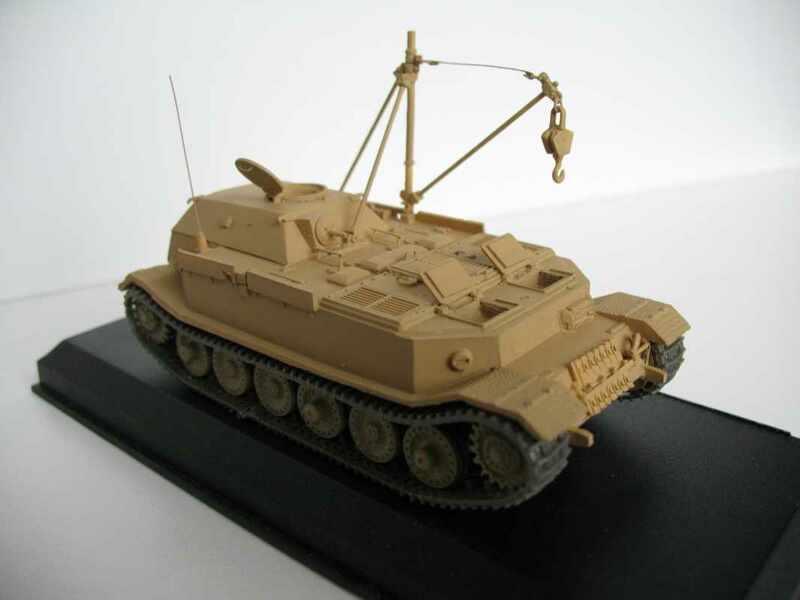 In 1943 however, three hulls were converted into recovery vehicles and saw service with schwere Panzerabteilung 501 on the Eastern Front. 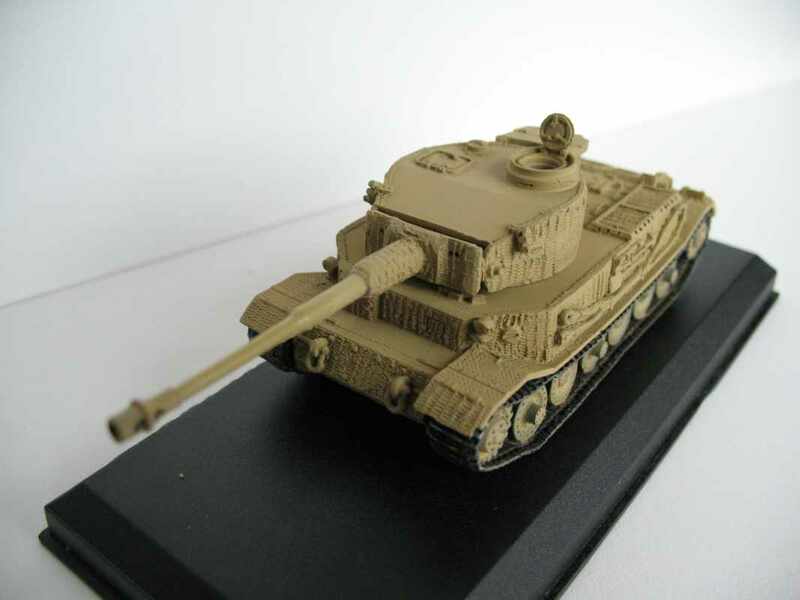 Ninety of these huge 88mm Tank Destroyers, based on the Tiger VK4501(P) were manufactured in early 1943 in time for the Kursk offensive. 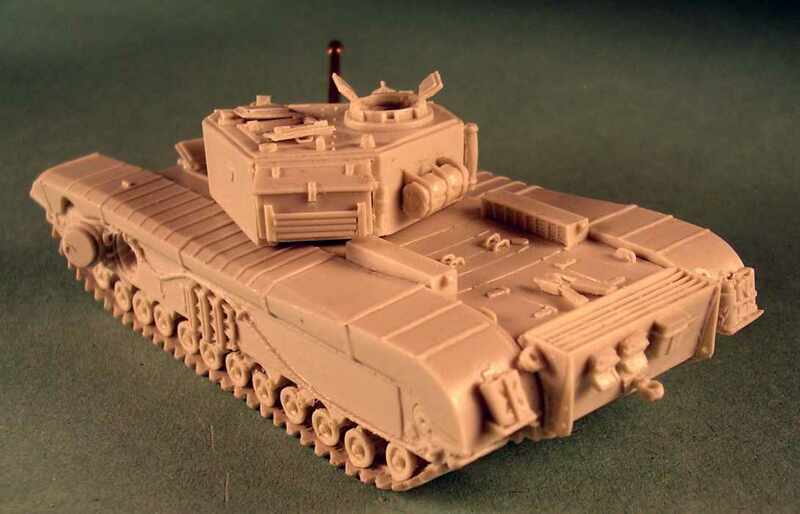 However following their disappointing debut performance the remaining fortythree vehicles were withdrawn for modifications, that in addition to a number of minor alterations, included the addition of a commanders cupola and a hull Machine Gun. 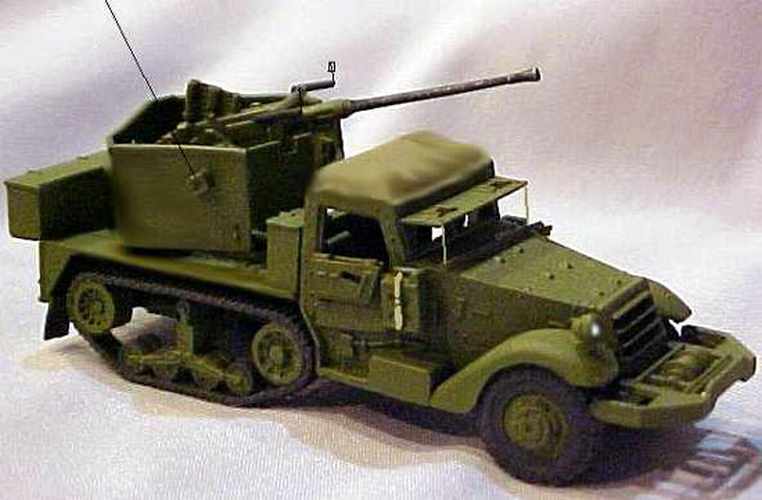 These upgraded vehicles were then renamed as the "Elephant".